For those of you new to these parts……the ABC Dinner Club is a group of friends who are making their way through the alphabet one restaurant at a time. 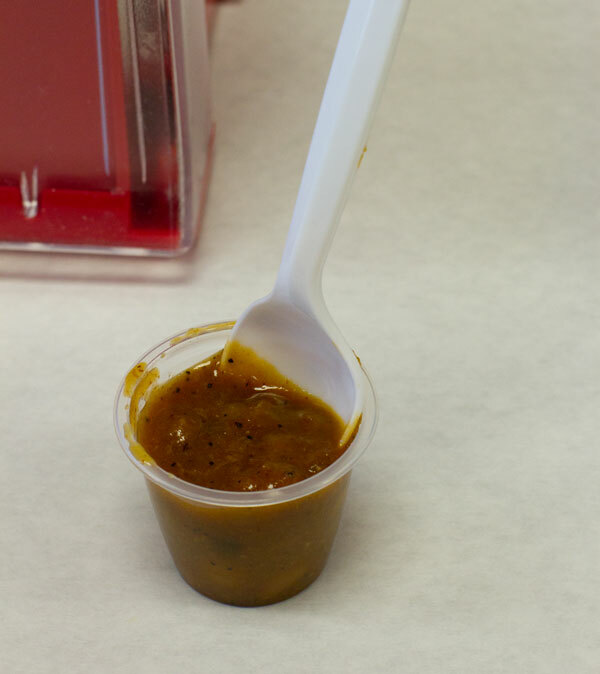 We are a group of five couples who have been going out to dinner for years since our now grown, some married children were toddlers crawling under the table and drinking hot sauce out of the dip bowl. I actually use to feel sorry for the wait staff when we would come in. As grown ups we were desperate for socialization and adult conversation but did not always want to afford a sitter. That meant as many as nine or ten children at a time would be with us. Of course we would frequent the restaurants that were kid friendly, but we were still quite the circus attraction. We have watched each others kid’s grow up; analyzed the baseball, soccer, and football games, discussed the dance recitals, swim meets and golf matches and reviewed the homecoming and prom pictures. We have evaluated college selections and choices of majors. We have attended graduations, weddings and have even visited a few new babies. 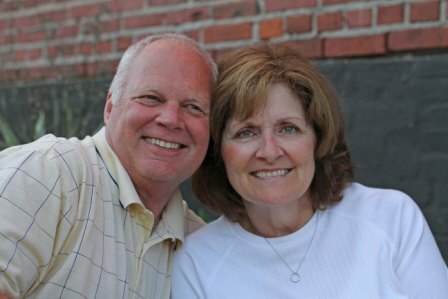 Through it all, we have gone out to eat……FREQUENTLY! As a fun project, we decided to start picking our restaurants by the letters of the alphabet. First we would find a restaurant that starts with A, then B, etc. We try to select a place where we have never eaten or at least do not attend frequently. We then record our project through pictures and the rating of the restaurant. One matter we must state up front are the qualifications we have for providing these ratings. In short, we have none, except for the fact we love to eat and we know what we like. 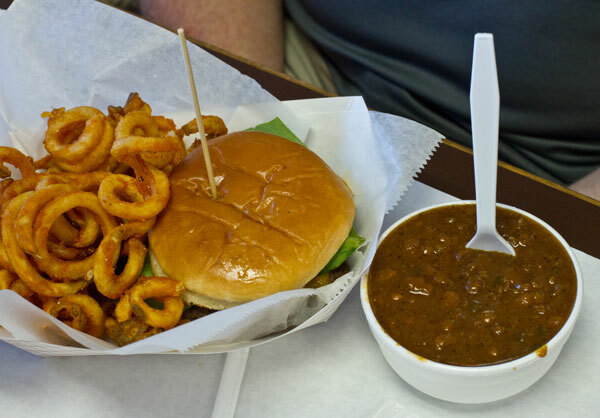 So do not expect a review based on culinary expertise or knowledge, but on the simple question…..”Will we come back here and eat again?” That is the bottom line for us. So here are the places we visited, presented in reverse order. 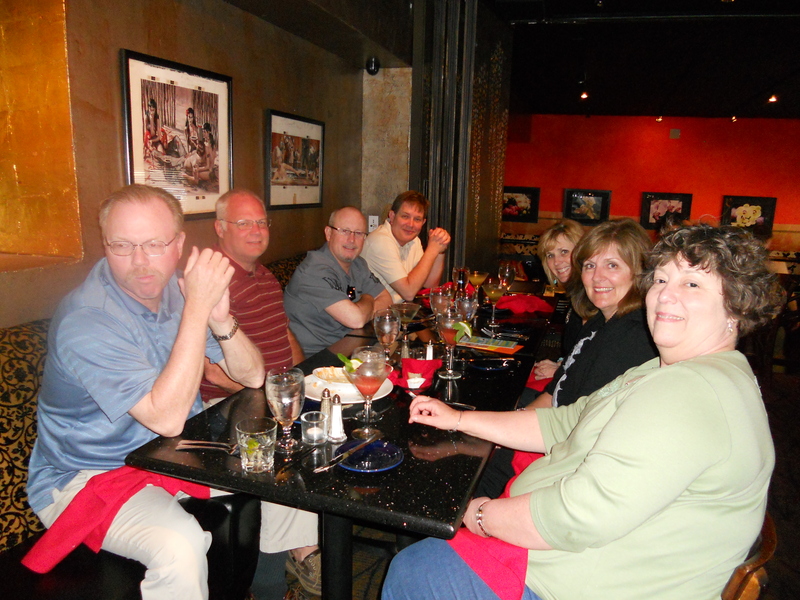 On the west side of the Country Club Plaza is a modern Mexican restaurant called Zocalo’s where we finished up our ABC Dinner Club. We were given a large table in a small side room that was perfect for our group of twelve. Our waiter was very friendly and attentive to our needs. We started our meal with a very good salsa trio and tortilla chips which were not complimentary as you might find in most Mexican restaurants. The menu at Zocalo’s was on the small side although the selections were interesting and unique. 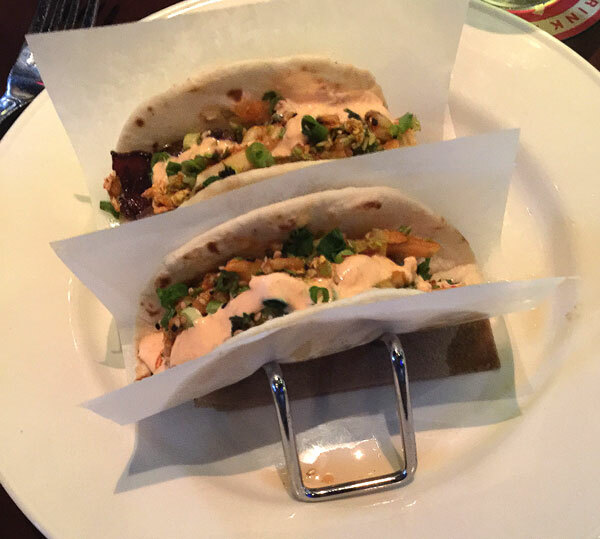 Several of us tried the tacos choosing the Pork Carnitos, Beef Barbacoa and Mahi Baja versions. A few others selected the Empanadas and the Zocalo Roll. 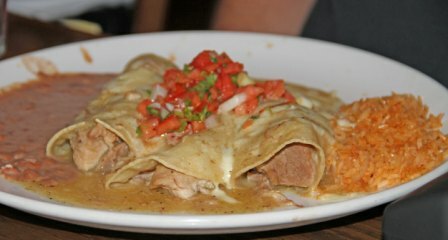 We also had a filet, Chicken Divorciadoas, Pork and Egg Enchilada and Grilled Chilean Seabass. Although this restaurant was not chosen as one of our favorites, the food was good and most of us would return in the future. This closes out our ABC Dinner Club! What a fun time we had. Nestled in the middle of the Kansas City Power & Light District is a contemporary and sleek restaurant called Yard House. Although part of a national chain, it feels unique in the original abstract art adorning the walls to the carefully selected playlist of rock geared to the time of day. Several of our group commented on how much they enjoyed the music which was loud enough to recognize the songs but not so loud as to drown out conversation. Our group of twelve was served by two very enthusiastic and helpful wait staff. 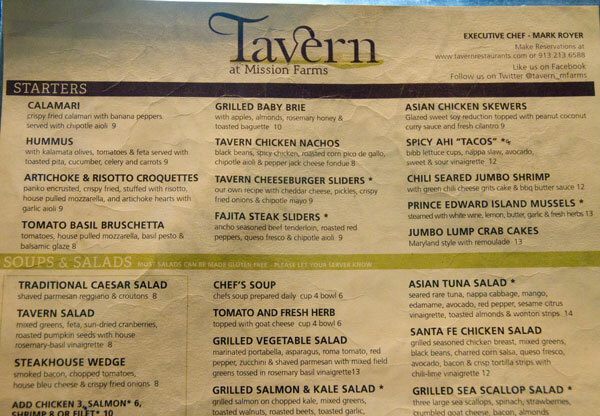 The menu of American Fusion selections from the total scratch kitchen was the largest I had seen in a long time, over 35 choices of appetizers alone. 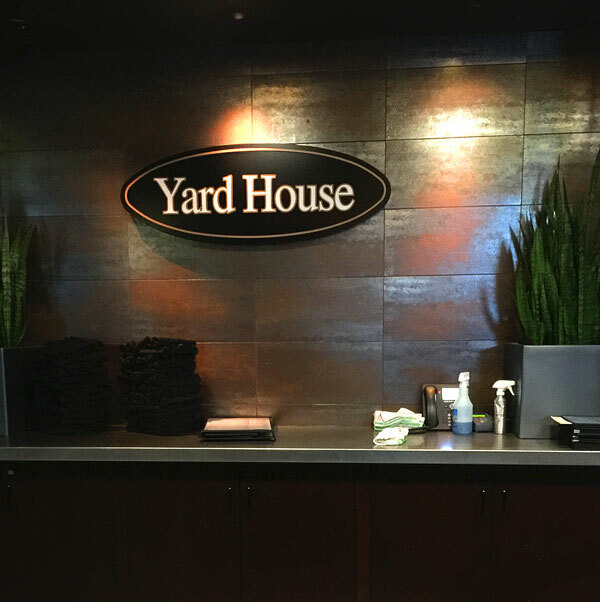 Per their website, Yard House also boast of over 4000 gallons of beer with 100 taps at all times. This is one of those places where if you cannot find something you enjoy eating and drinking then you should just stay home. As impressed as our group was with the ambiance, the real test for us is how does the food taste. We did a good job of ordering an eclectic mix of selections. I know several people who could eat in repugnant and grimy surroundings as long as the food tasted good. I am not that person. For me the venue needs to be just as pleasant as the food, not fancy, just relaxing and enjoyable. 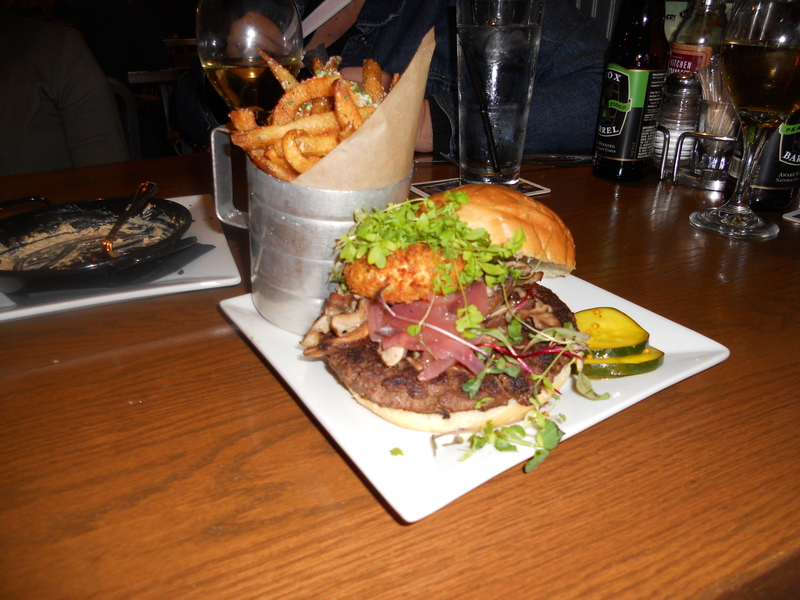 Yard House definitely fit that bill, I cannot wait to go back. 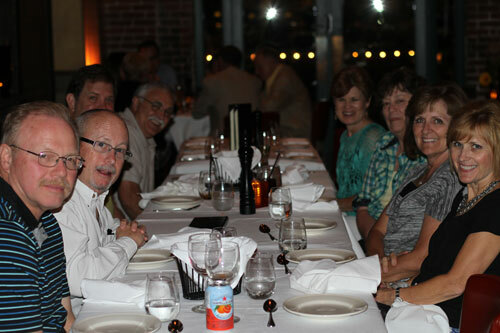 Our entire dinner club had an enjoyable evening of conversation, good music and great food. 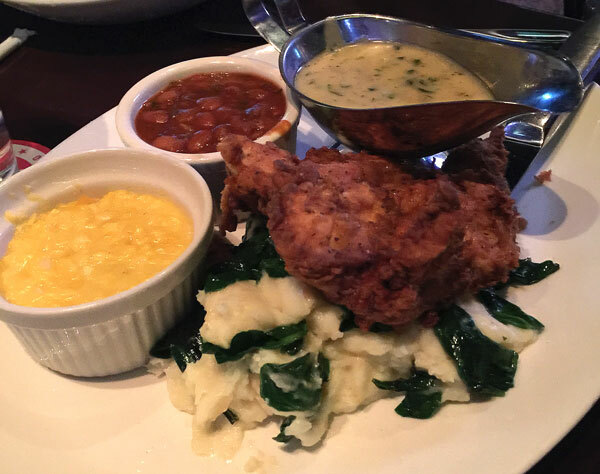 We would definitely recommend this restaurant, especially the Power & Light location. Only one more letter left for our ABC Dinner Club remaining! After unsuccessfully searching for a restaurant that starts with the letter “X”, the ABC Dinner Club settled for a restaurant name that sounded like it started with “X”. Hey, it’s our club, we make the rules! 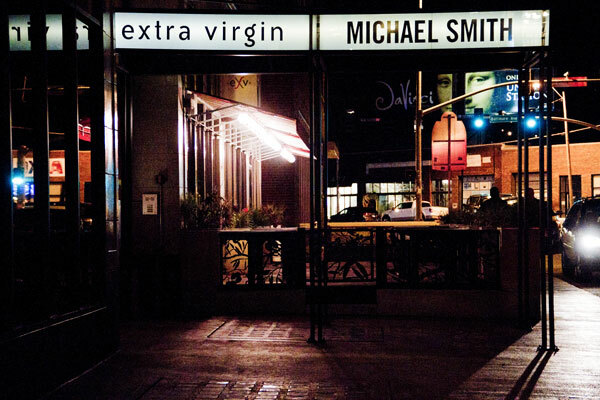 Extra Virgin is the brainchild of the James Beard award-winning chef Michael Smith, featuring a Mediterranean tapas menu. 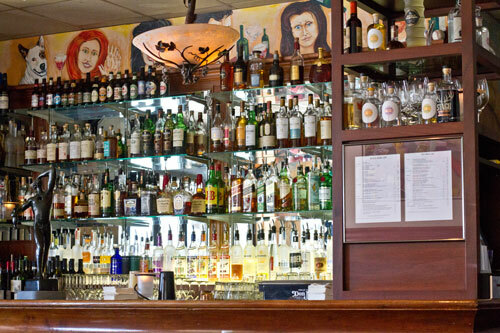 The small venue is well known in the trendy, after-work, “let’s get a drink” crowd. The atmosphere is up scale, modern and since our group visited on a Thursday evening after most of the happy hour crowd had left, it was relatively quiet and not crowded at all. The menu is very creative and would be a delight for anyone who is interested in an adventurous eating experience, think Roasted Marrow Bones and Sea Urchin Pasta. 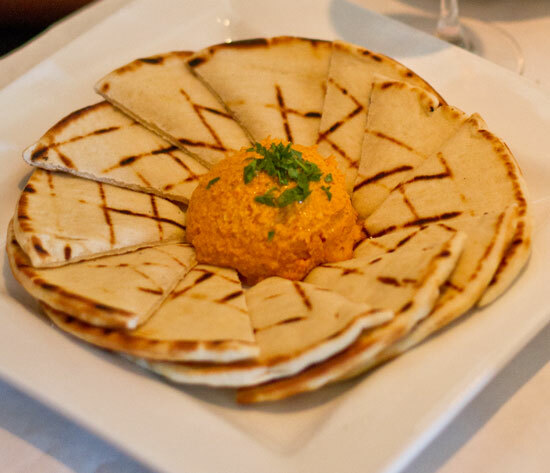 In case you are not familiar, tapas or ‘small plates’ consists of a wide assortment of appetizers and snacks. 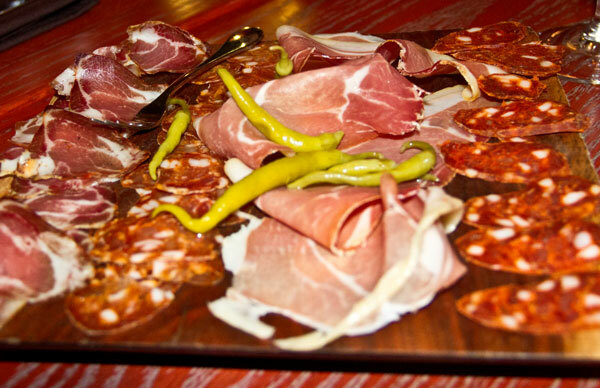 The serving of tapas are meant to encourage socializing and conversation and not place so much focus on a meal set before the person. A few other items we tried included Chicken Thighs with chorizo and figs, Shrimp and Pork Belly fried rice and deviled eggs. Most everyone in the group thought the food was excellent and unique. Our server was attentive and helpful in our menu selections. We even talked him into sampling Grandma Zvacek’s no-bake cookies that were brought for a birthday treat! Bottom line: Although I think everyone enjoyed our visit, a few mentioned they would not return because “tapas” were not their thing. I on the other hand loved it and will definitely go back sometime when I am in the mood for something special with regard to drinks and appetizers. The girls of the ABC Dinner Club decided to take on the letter “W” by themselves a few weeks ago when several of the guys were out of town. 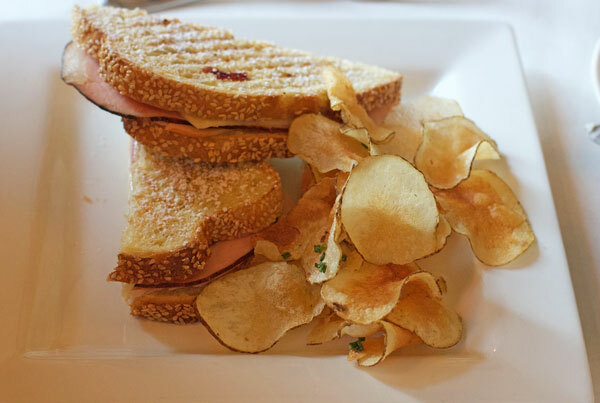 We ventured out for a Saturday lunch in downtown Kansas City at the Webster House. 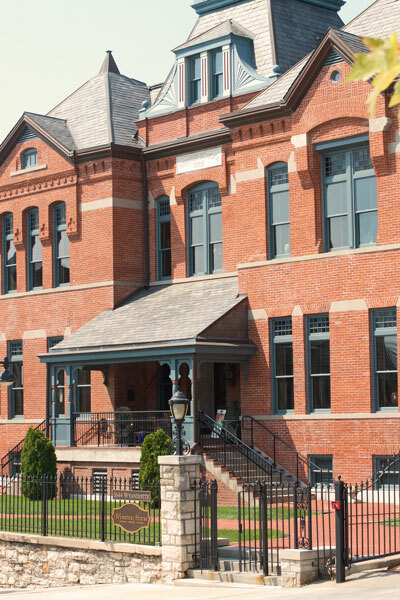 This gorgeous old building, directly across from the Kaufman Center for the Performing Arts, was originally constructed in 1885 as a school building for the Kansas City School district. 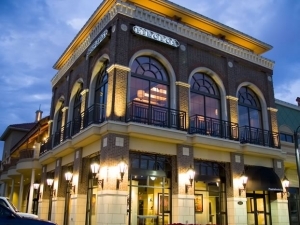 More than a hundred years after it’s initial opening the building was magnificently restored at the direction of Shirley Helzberg into a destination dining and shopping experience. 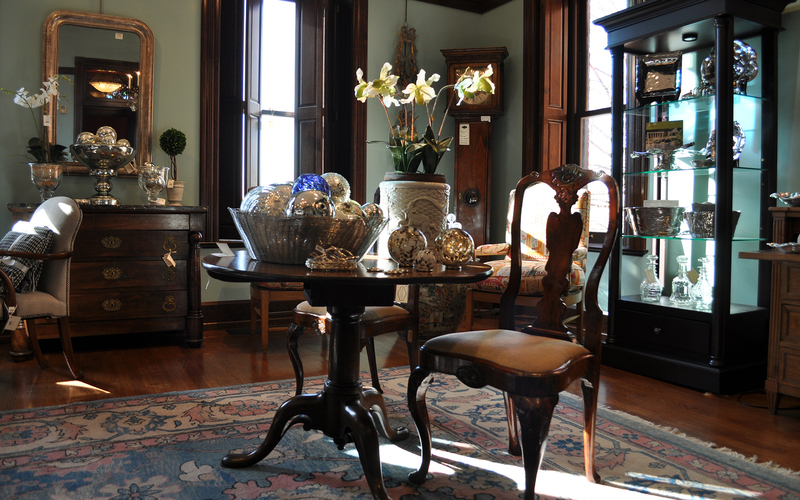 The first floor of the building houses unique gifts, antiques, clothes and jewelry while the second floor is reserved for dining. 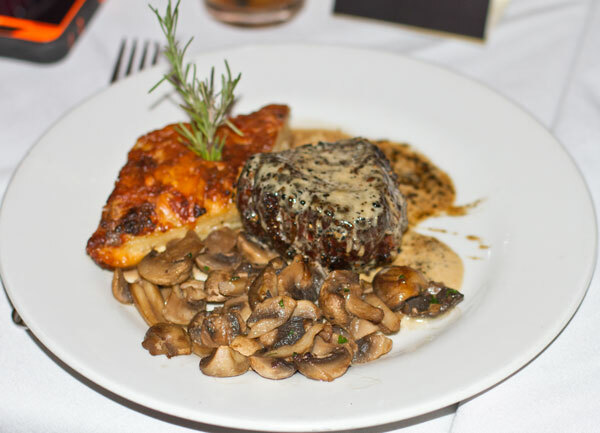 The atmosphere is elegant and sophisticated and lends itself well for a special occasion. 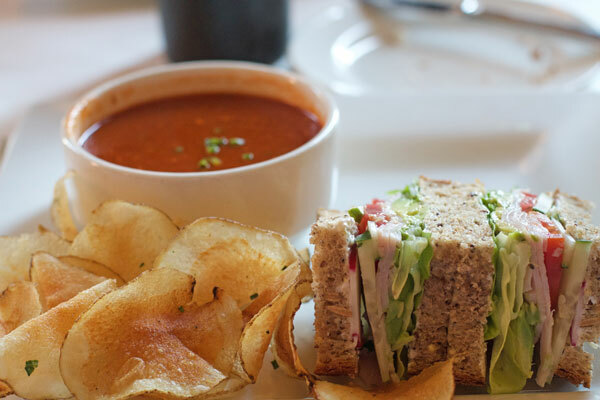 The lunch menu provides a good selection of soups, salads and sandwiches as well as several appetizers and a few large plate entrees. 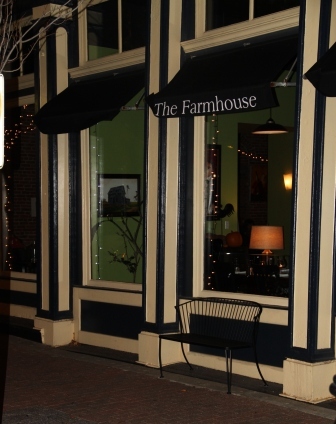 Webster House attempts to source the majority of it’s ingredients from local suppliers offering a true farm to table experience. 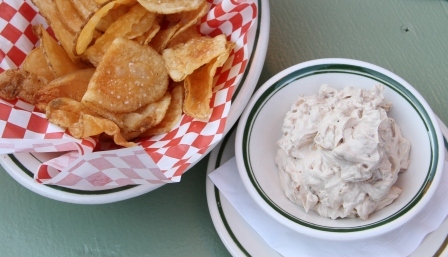 We all enjoyed our selections, especially those homemade chips! I have to say this was probably my favorite restaurant to date with the ABC Dinner Club. I can’t wait to go back and try their Sunday brunch. Our dinner club was challenged with the letter V and could not find many choices for this meeting of our group. 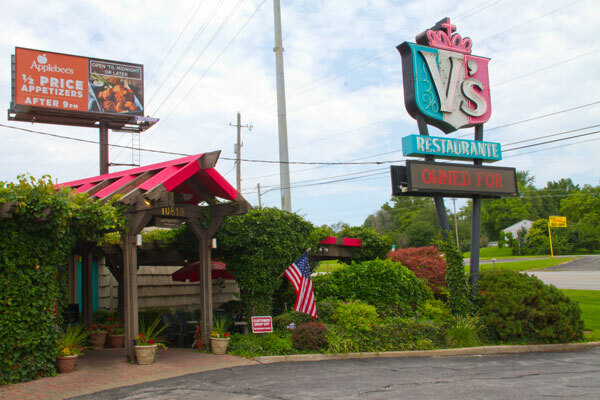 After voting we decided to go for brunch at a long time family owned restaurant in Independence called V’s. Most of us had eaten either brunch or dinner at this establishment before so there were not many surprises. The facility is original to it’s 1963 opening and not much has changed in the way of décor or seating. Once seated we were provided with coffee and mimosas, although I question if real orange juice was used. The taste and look reminded me of a drink from my childhood, TANG, another 1960 vintage. Brunch was served buffet style and consisted of the usual breakfast fare, scrambled eggs, eggs benedict, biscuits and gravy, French toast, bacon and sausage. Dinner items included carved roast beef and steamed vegetables. 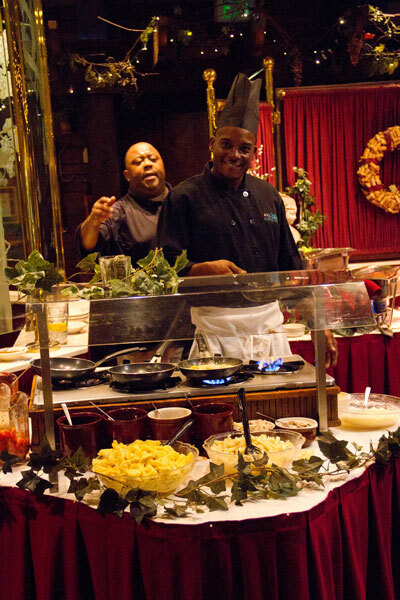 A pasta station was also available where your choice of sauce and pasta were mixed and sauteed to order. 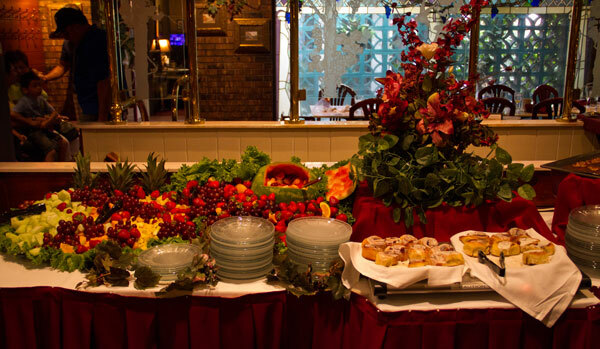 The dessert station was a colorful mix of fruit and assorted pastries. In my opinion the best selection of the entire menu was the cinnamon rolls. Not everyone in our group shared my opinion but I feel the food was good, not great. There are many very good brunch selections in our town and this is not at the top of my list. 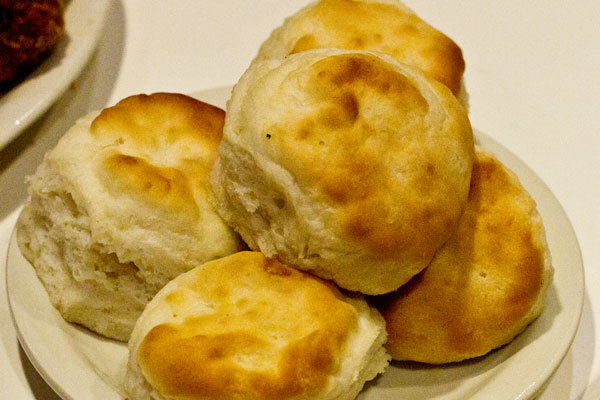 Some of us would return for the brunch, some of us probably would not. Our ABC dinner club is getting close to the end of the alphabet and had a little bit of a challenge trying to find a restaurant that begins with the letter “U.” We thought about UNO Pizza but before we could get there all of the KC locations closed. 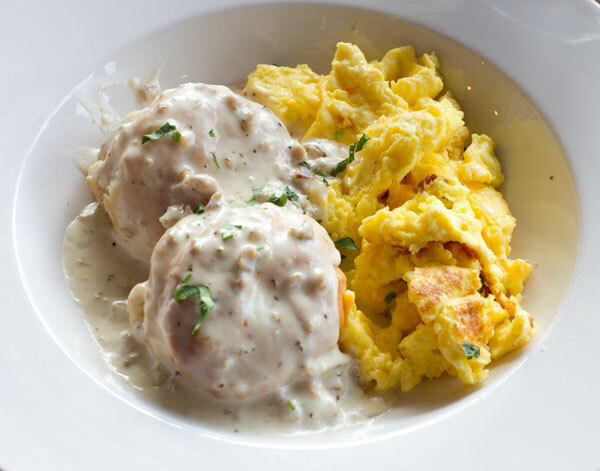 We thought about Union Station Café, also now closed. Most of us had eaten at UNK’s Burgers before but for the sake of the dinner club continuity we chose it for our latest bash. Unk himself greeted our group and his big personality and willingness to please his customers go a long way in this family owned, hole-in-the-wall burger joint. 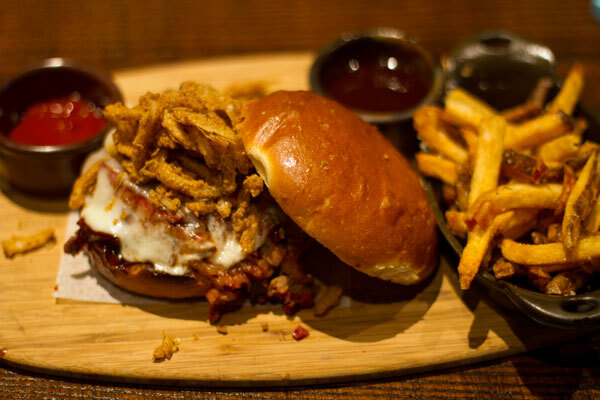 According to the menu, all the burgers are fresh, 100% ground beef and hand formed. 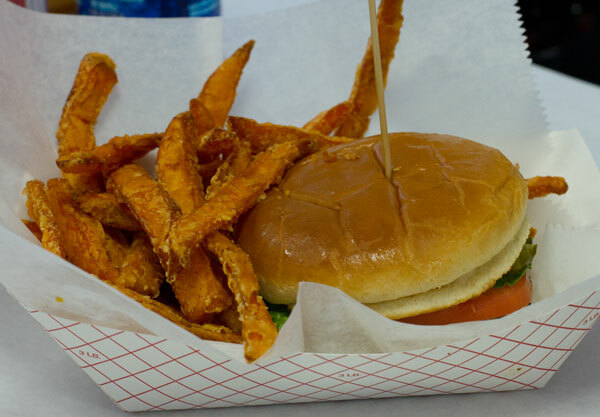 The burgers are cooked to order so the wait on dinner is a little longer than you would typically expect in a burger joint. Baked Beans are a specialty with a unique recipe that includes turkey and pickles. Each time I have been there UNK has provided samples of the beans so you can taste before ordering. 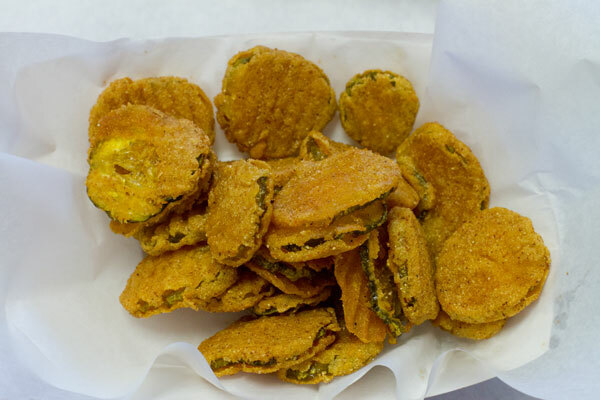 Other side choices include onion rings, fried pickles, jalepeno poppers along with sweet potato fries and tots. There are a few creative burger combinations on the menu including the “Hot Headed Niece” which is packed with chopped habanero peppers and topped with pepper jack cheese, the “Sweet Auntie Burger” topped with bread and butter pickles and the “Bodacious Baked Bean Burger” which is a burger topped with Unk’s special baked beans. 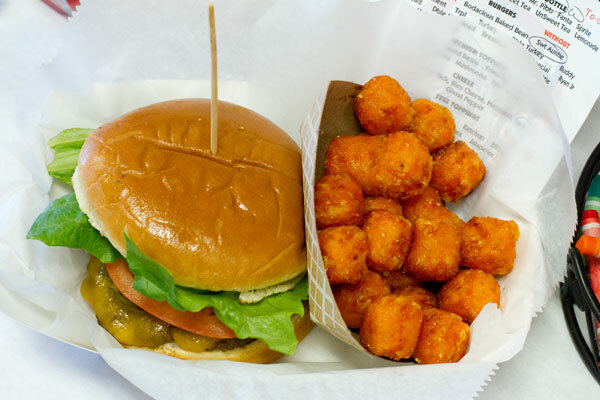 The Unk Burger can be made to order with both free toppings and premium toppings for a nominal fee. Our group ordered a variety of burgers and sides. At the end of dinner Unk came around with complimentary hot out-of-the-oven chocolate chip cookies. Our group was divided on if we would return to UNK’s or not. For those in our group that like hole-in-the-wall burger joints, they thought the burgers tasted good and they would return. A few of us probably would not go back. You will need to decide for yourself on this one! This stylish and upscale restaurant was the location of our “T” episode in the ABC Dinner Club saga. The “Classic American Cuisine” as described by their website averaged $20 for main entrees, sides and salads extra, and about $10 for “handhelds” which were sandwiches or tacos served with fries. Service was above average for our group of twelve and the atmosphere conducive to dinnertime conversation which is always a plus for me. 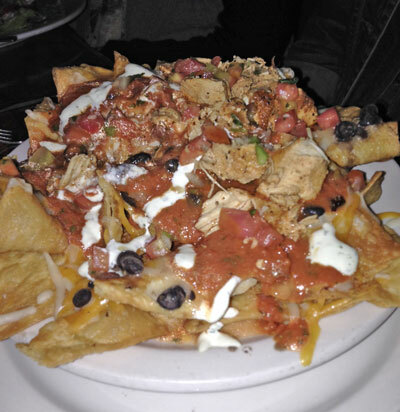 A few of us started our meal with a salad and for me personally this was the highlight of the night. 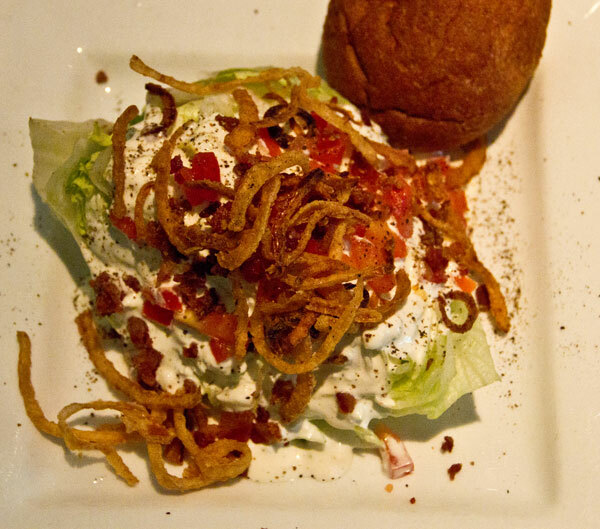 I LOVE Wedge Salads and this one came with french fried onions on top…..one of the best Wedge salads I have ever had. 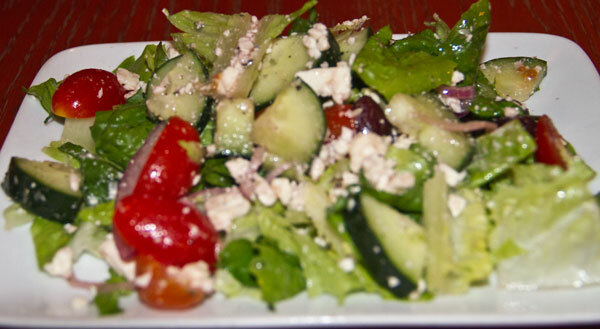 Several others ordered the Tavern Salad which was a mix of greens, feta, sun-dried cranberries, roasted pumpkin seeds with house rosemary-basil vinaigrette. Everyone who ordered one really enjoyed it. 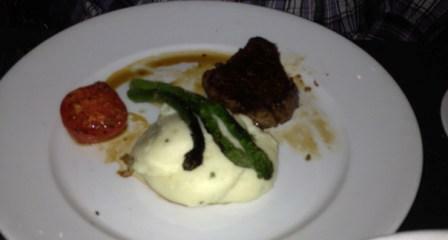 Several of the main entree’s were quite interesting and our group did a good job of sampling several different items. Although not pictured, we also ordered Shrimp Tacos, Pork Osso Bucco and Chicken Parmesan. Everyone thought their selection was good! Bottom Line: We will come back someday! 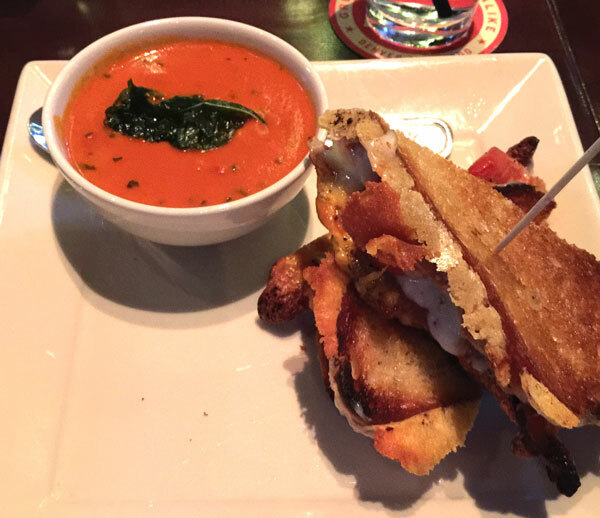 Our dinner club stepped out of our usual Saturday night routine a week or so ago and tried the new Sunday brunch menu at Summit Grill and Bar. 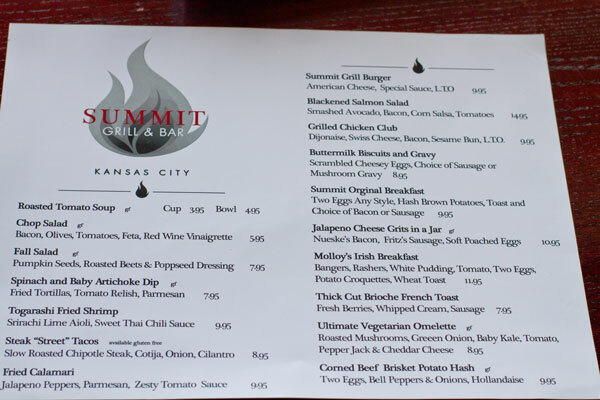 Summit Grill opened their first location in Lees Summit, Missouri a few years back and recently opened a new location in Waldo. 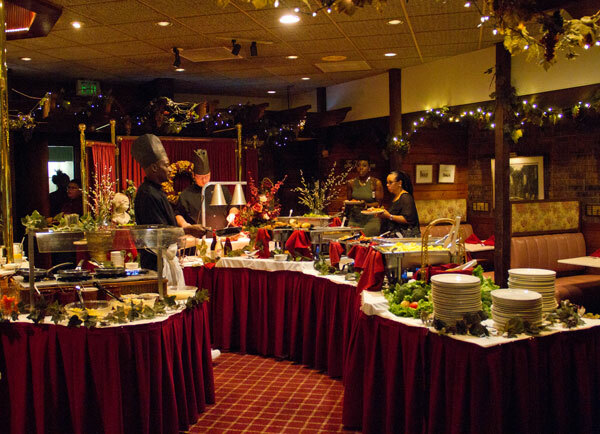 Thankfully, Summit Grill takes reservation since we are usually dining with a party of 10-12 people. Once we all arrived we were seated immediately. The Waldo location is much smaller than the original location and on this Sunday morning the restaurant was packed. 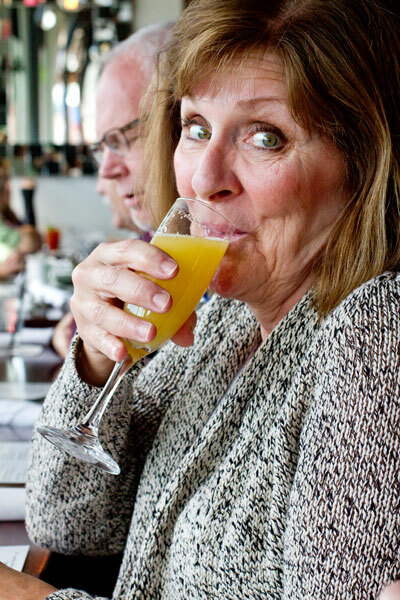 Our server immediately offered us bottomless mimosa’s or bloody mary’s which in my book was a sign of good things to come. 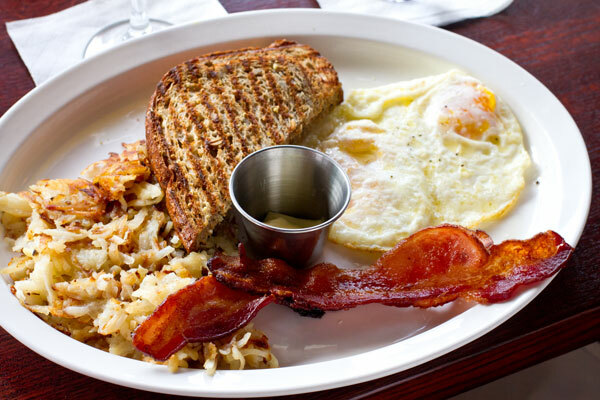 Several in the group selected the Summit Original Breakfast which is served with two eggs any style, hash browns, toast and a choice of sausage or bacon. 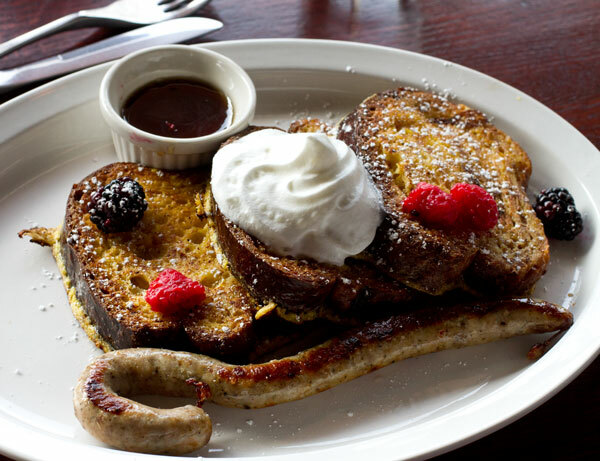 A couple of people ordered the Thick Cut Brioche French Toast that was served with breakfast sausage. 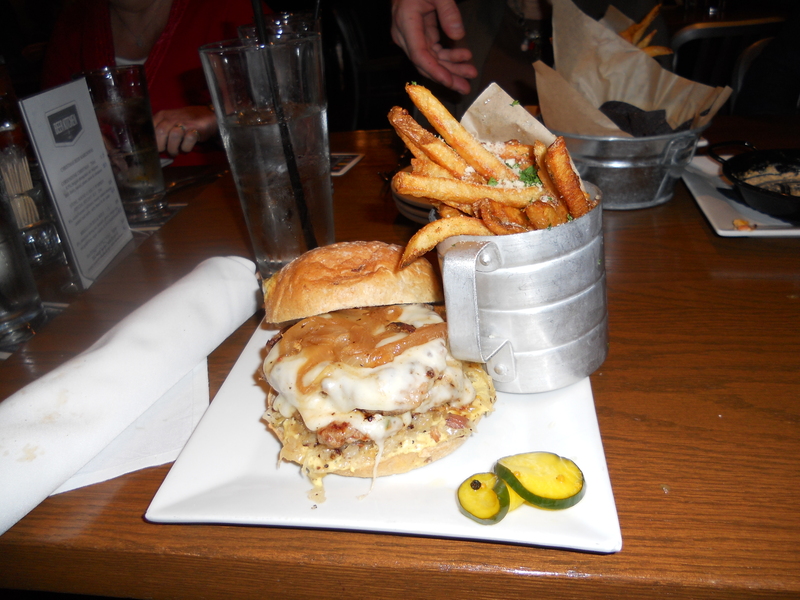 One person in our group went the lunch route and chose the Summit Grill Burger. 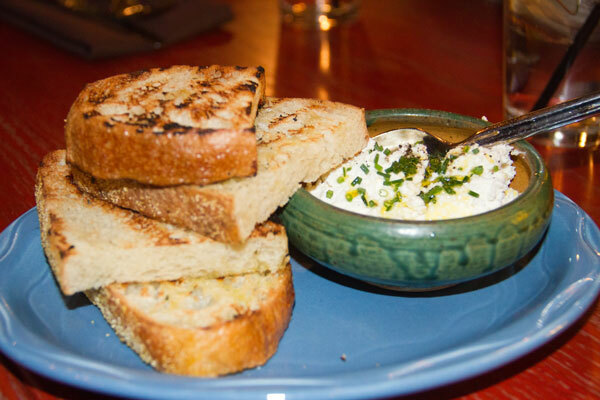 Although no one in our group ordered the Jalepeno Cheese Grits in a jar, it sure looked interesting and may require a second trip just to try it out, although I am pretty sure the bottomless mimosa’s and bloody mary’s were enough to secure a repeat visit! Overall a definite thumbs up from our dinner club! 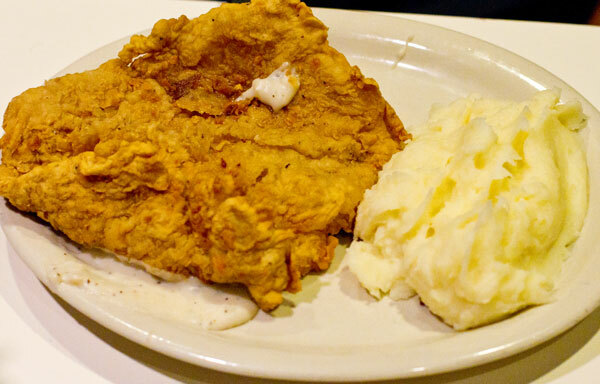 If you love dishes like grandma used to make and want a large plate filled with all that goodness, then get right down to RC’s in Martin City. 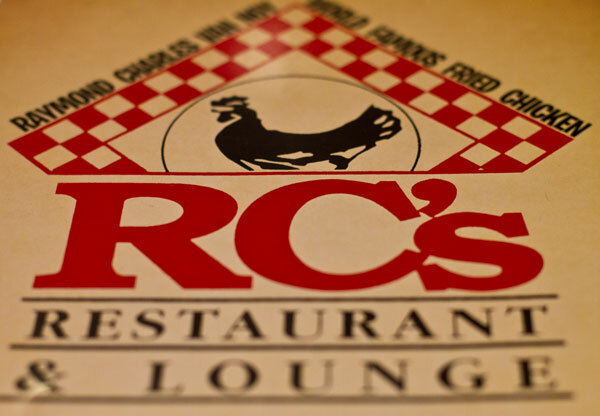 Known for it’s pan-fried chicken, RC’s did not disappoint our food lovin’ group. We had reservations for ten on a Saturday night and although the restaurant was busy, it is a large venue and there were not many people waiting for a table. 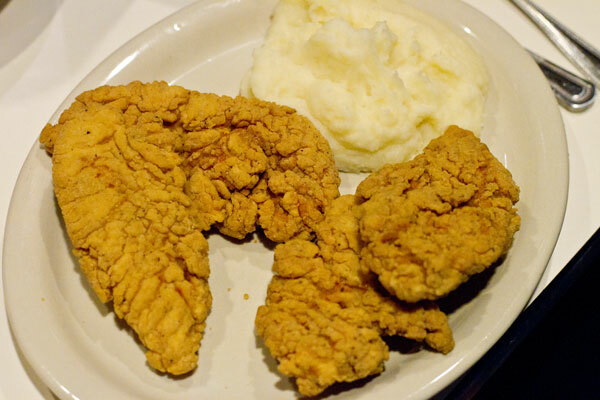 The menu is packed with deep fried chicken varieties but also included steaks, sandwiches and salads. 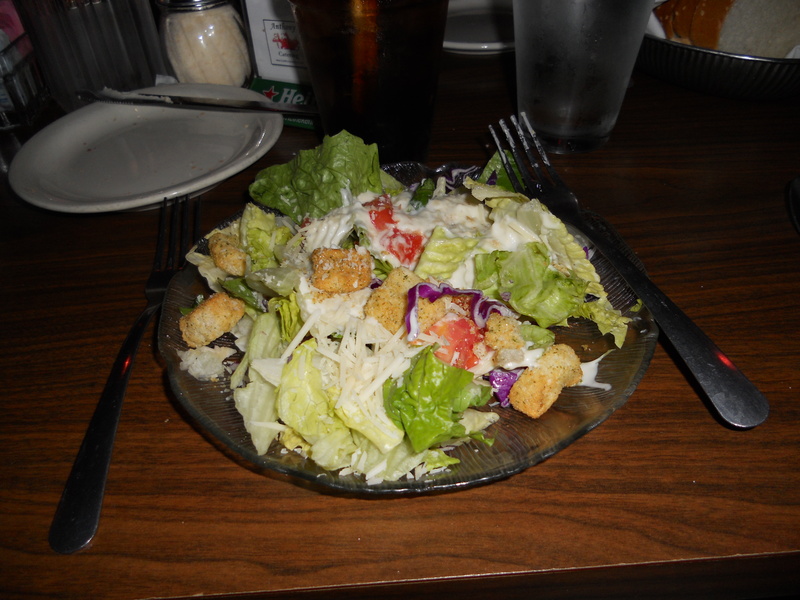 We started with a typical restaurant side salad, that was adequate but nothing special. 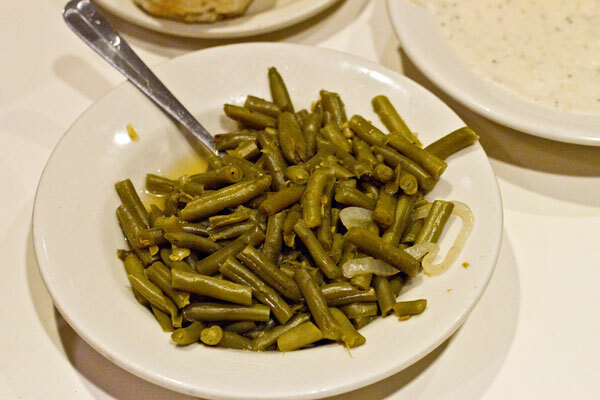 The green beans, white gravy and biscuits were then served family style. The entrée’s were brought out next and the plates were literally overflowing with the meat and mashed potatoes. 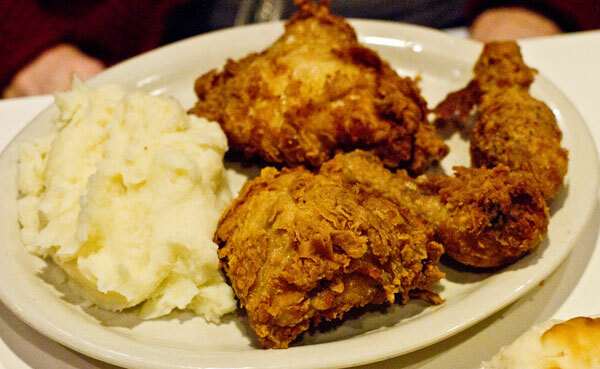 A couple in our group ordered the pan-fried chicken and specified if they wanted white or dark meat. 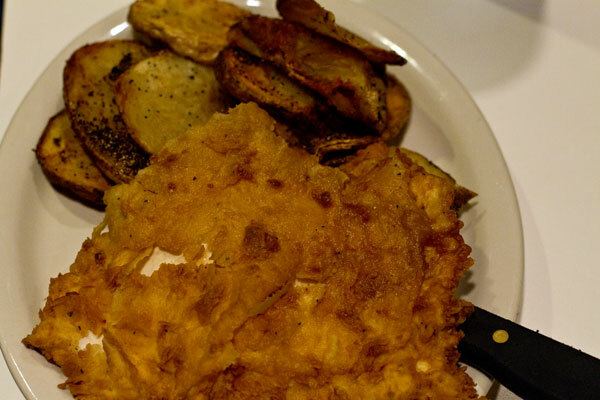 Others ordered chicken fingers, chicken fried chicken and pork tenderloin. Although I can not imagine why, one even opted out of the mashed potatoes for the cottage fries. If you want to eat on the healthier side they did offer a grilled chicken entree along with dinner salads and sandwiches. 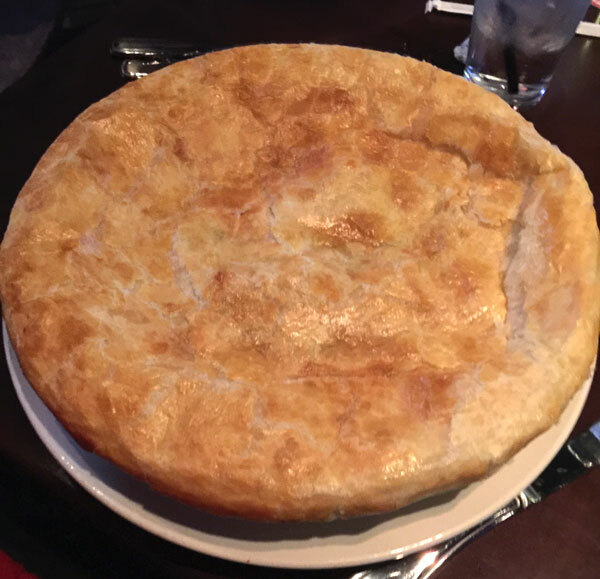 The meals were definitely on the heavy side but everyone in the group enjoyed their dinner and look forward to the next time they visit. My first reaction to Q39 was one of surprise. 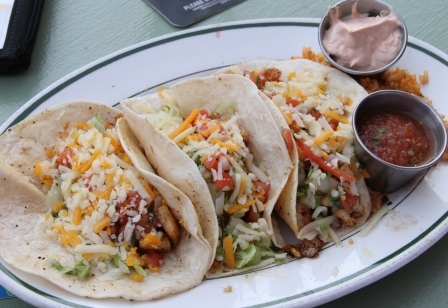 I have frequented my share of little dives on 39th Street and was expecting more of the same. Instead, when our group walked in we were greeted with a large, modern-rustic environment bustling with customers and activity. 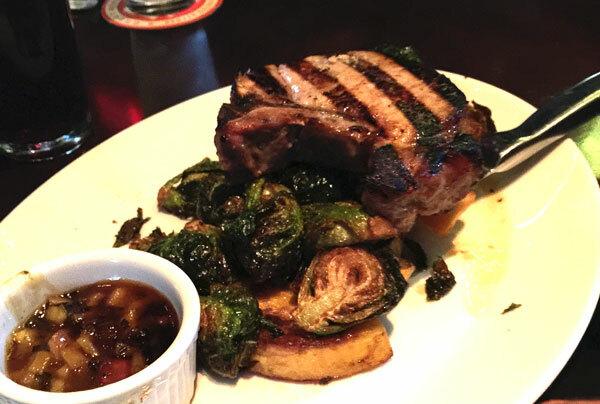 We chose to visit Q39 on a busy Saturday night and even though we had reservations we waited about 30 minutes for a table. The wait turned out to be worth every bite we took that night. 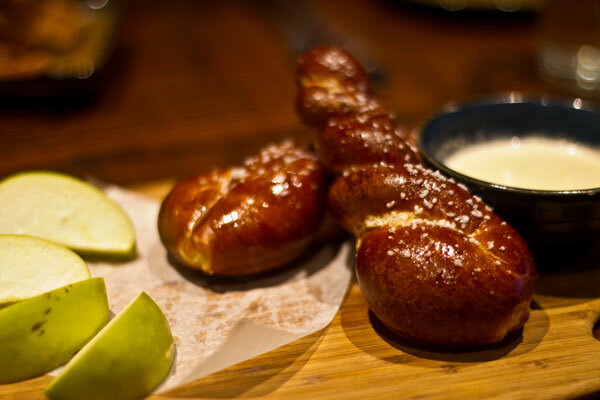 We started our dinner with a cheese fondue served with warm pretzel bread along with a platter piled high with onion straws. 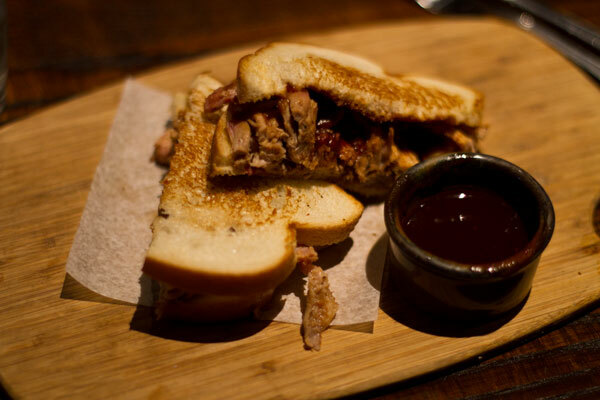 and the “Pitmaster” brisket sandwich reminiscent of a certain Z-Man. 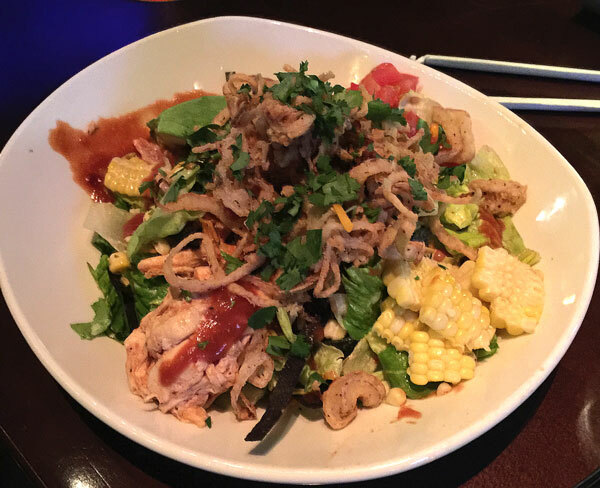 The menu offers several light options including a few salads that sound interesting and a side dish of apple slaw that I need to taste on our next visit. 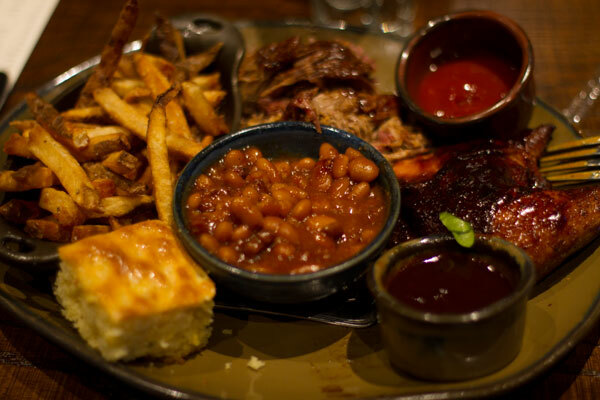 Our resident bbq experts rated Q39 “Very Good” which means a great deal in this smoked meat town. We unanimously voted that we would return! 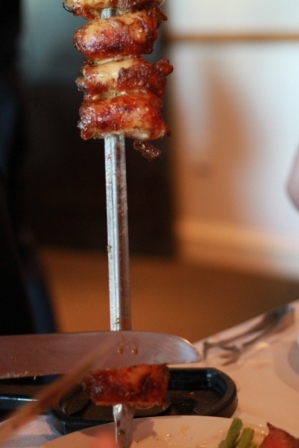 Located in Briarcliff Village, at the top of a bluff with an incredible view of the city, Piropos is an upscale Buenos Aires influenced restaurant that was simply amazing. Despite the fact that they had no knowledge of our open table reservation for 12, we visited on a Sunday evening with a light crowd so were immediately seated. The view from the floor to ceiling windows of downtown Kansas City was incredible. The wait staff was very attentive and promptly served us drinks and assorted breads. 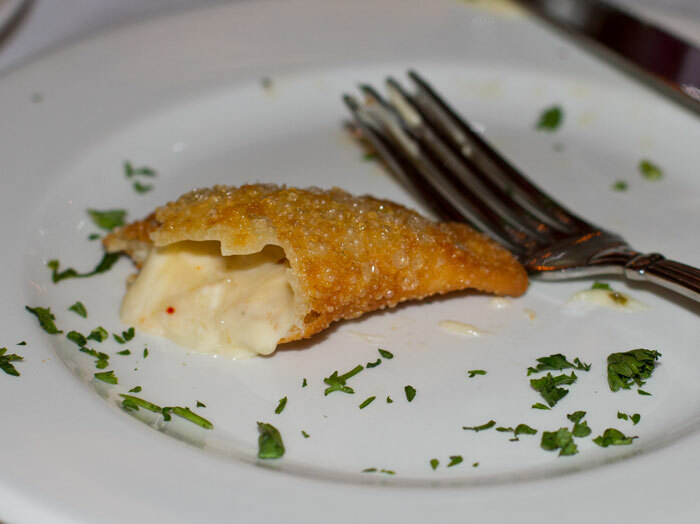 A few of us started with their signature handmade empanadas which were light, crispy and oozing with flavor. All in our group thought the food was wonderful. 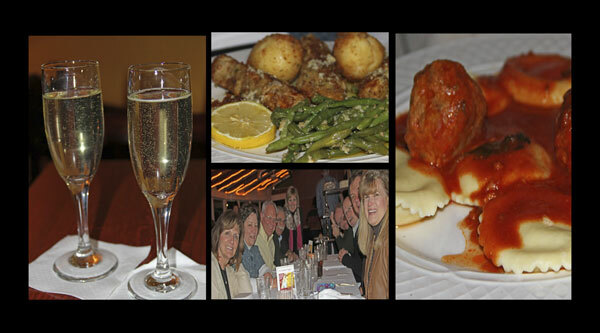 This restaurant would be an excellent choice for a special occasion such as an anniversary or birthday celebration. A few in our group felt rushed with the rapid delivery of our entrees liked the staff was just trying to get us out of there. For the majority of us this was not an issue and we thoroughly enjoyed our experience. Overall a definite thumbs up! 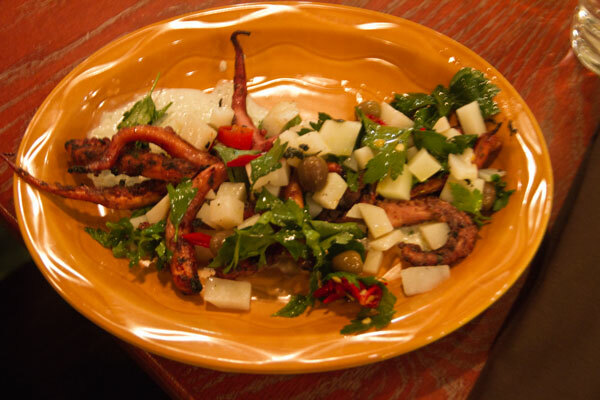 What a gem we found when we visited this cozy, authentic Italian restaurant just south of the Plaza. We had been warned that the dining room was small and the wait long on Friday and Saturday evenings, therefore to accommodate our group of 12, we ventured out on a Monday evening at the fairly early time of 5:30. 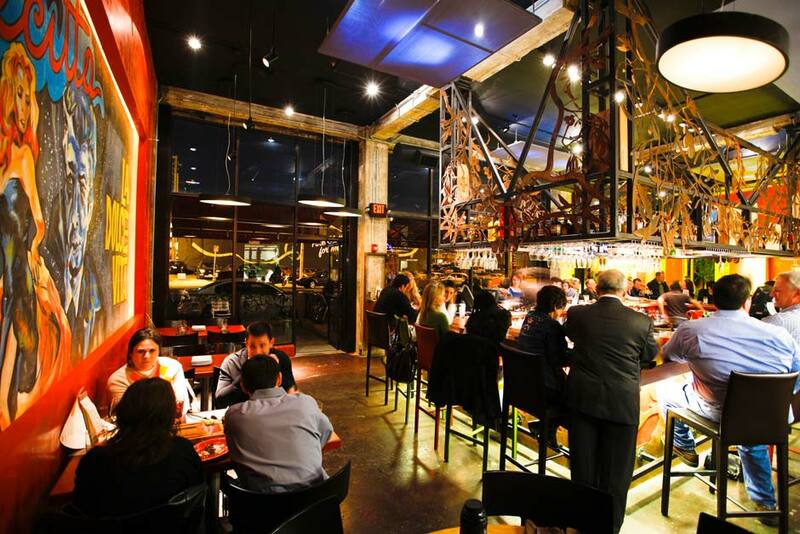 The capacity of the dining room is only 70 guests, but the atmosphere and food far exceed what the dining room lacks. 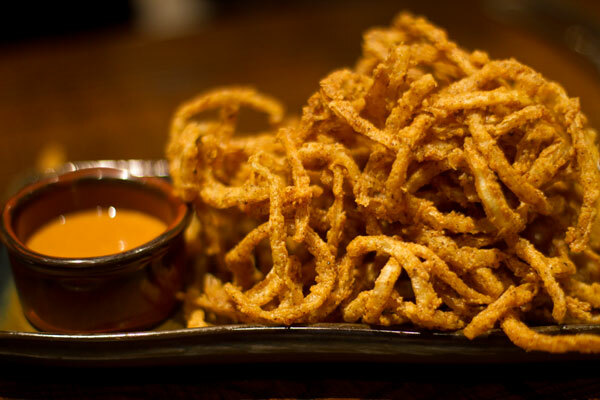 An unexpected advantage of visiting early in the evening was half price appetizers. 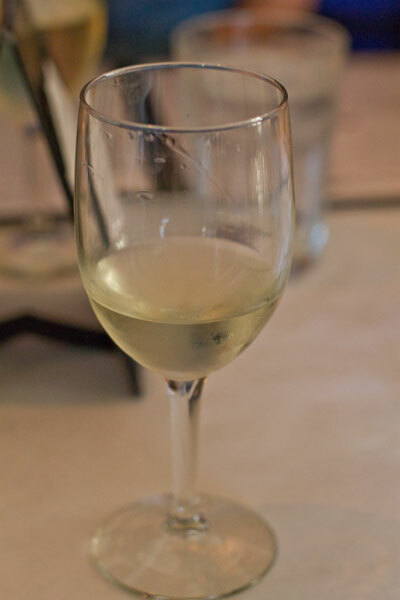 We were also able to take advantage of the Monday promotion of any glass of wine for $7. If you are a wine lover, you definitley need to visit OIC who was recently awarded Wine Spectator’s “Best of Excellence” award for 2014. 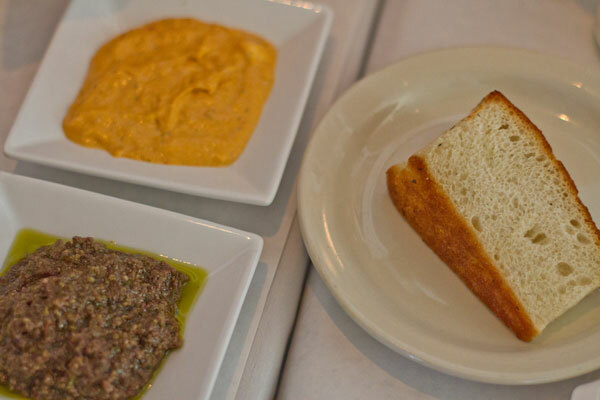 We started our dinner by sharing the following Primi Piatti’s; brushetta topped with parmesan, focaccia with five olive tapenade and roasted pepper gorgonzola spread and sweet roasted red pepper hummus with grilled pita bread. This small, quaint venue would be the perfect place for a special event or a romantic dinner for two. 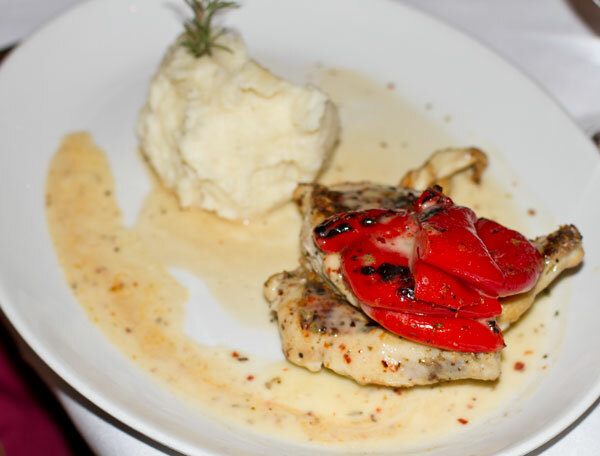 It offers a great value for the exceptional food that is served. 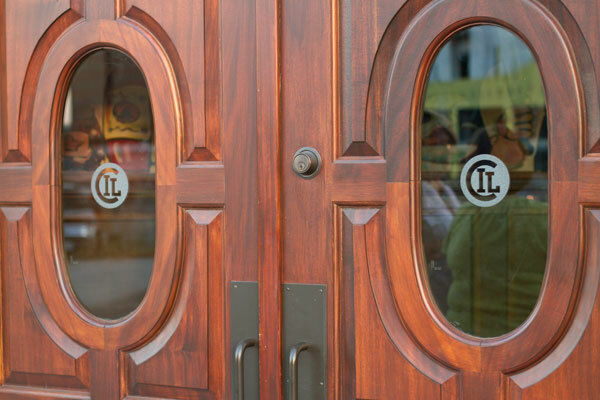 Bottom Line: The decision was unanimous on this restaurant, we cannot wait to return. YUM! The ABC Dinner Club attended a production of the old classic play HARVEY starring Charles Shaughnessy for our N stop on the alphabet adventure. 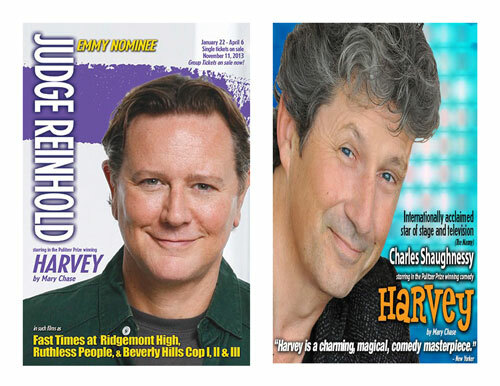 When we purchased tickets we were expecting to watch Judge Reinhold lead the cast, however a disagreement between the star and the New Theatre’s owner/director resulted in Reinhold leaving the set and the New Theatre cancelling the opening night performance of this play for the first time in the company’s history. Shaughnessy stepped in to fill the role and gave an admirable performance given the short preparation time. Drama aside (pun intended), the evening was a pleasant, non-routine gathering for the group. 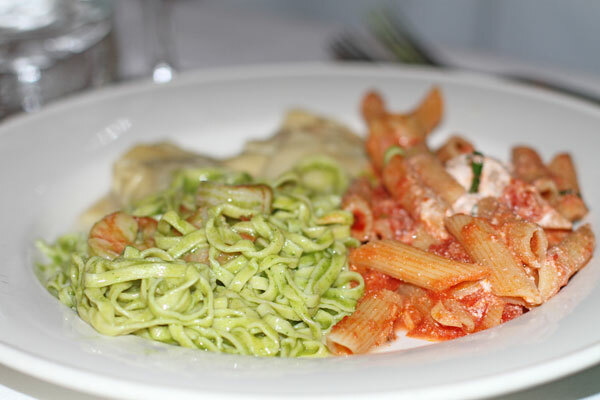 The food was typical of a large venue, served buffet style and included pasta, grilled chicken, fish and beef selections. Steamed broccoli, carrots and roasted garlic potatoes were a few of the sides offered. 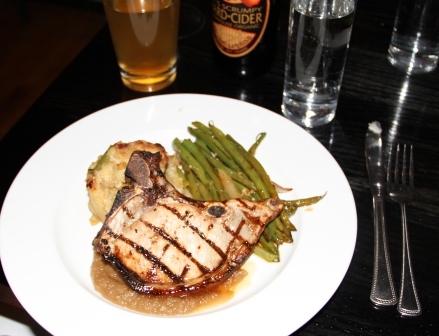 The main meal is part of the theatre ticket but any adult beverages or desserts were an additional cost. Our party of eight qualified for a “group sale” and although prices were not significantly discounted, the customer service both before, during and after the evening were note-worthy. 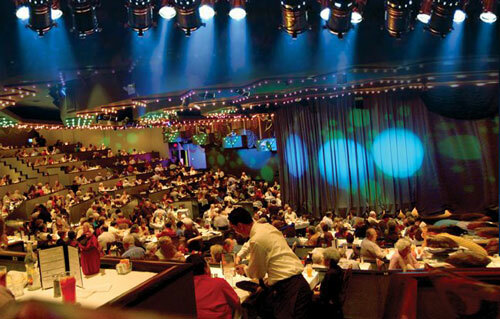 Bottom Line: Many in our group would return to the New Theatre Restaurant citing that the real reason for coming is the live production. A few however, found the food to be somewhat “institutional style” cooking and not up to the “Five Star Cuisine” boasted by the venue. 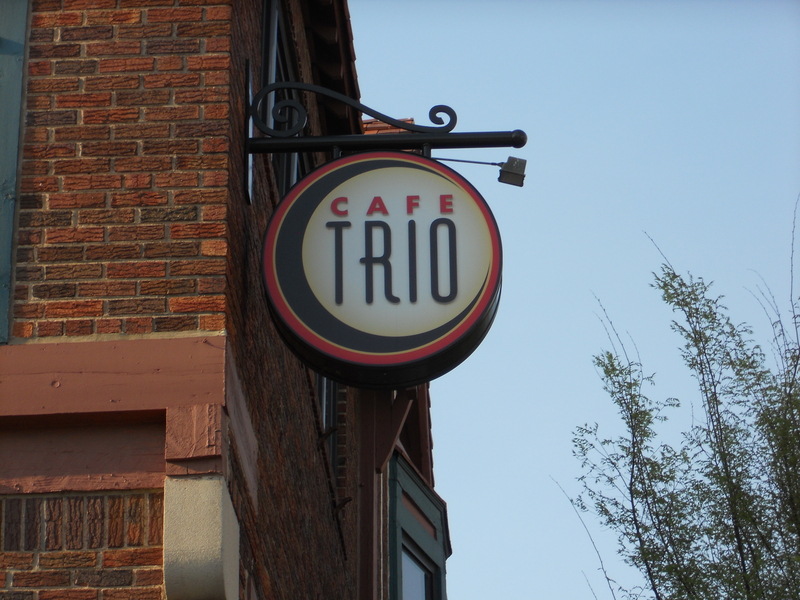 What is it about this unlikely two block square area in southwest Kansas City that draws a steady stream of hungry patrons? It must be names like Jack Stack BBQ, Jess and Jims Steak House and RC’s. 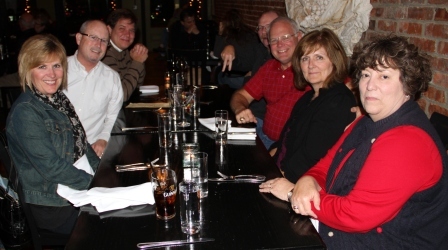 A newer addition to this group of familiar establishments is where the ABC Dinner Club convened for our “M” installment. 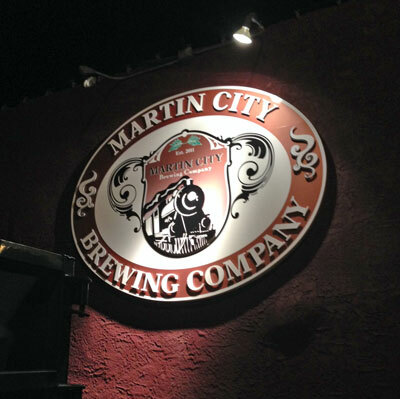 Martin City Brewing Company proved to be a pleasant surprise for those in our group who had not visited before. 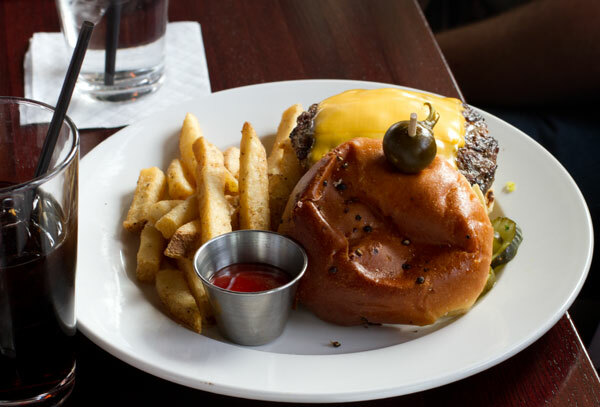 Although the menu does include typical bar food such as burgers and nachos, you will also find unexpected entrees such as a Blackened Fish Sandwich, Reuben Corned Beef and a selection of gourmet mac and cheese. 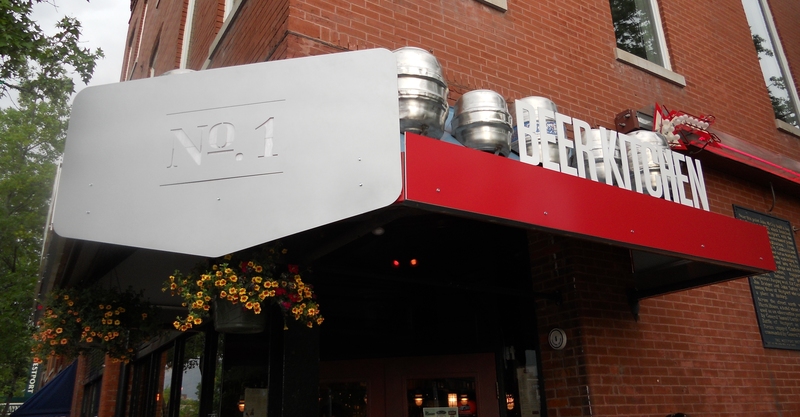 The beer selection includes up to 50 varieties with 14 drafts which change frequently. They suggest following them on twitter for the latest selections. 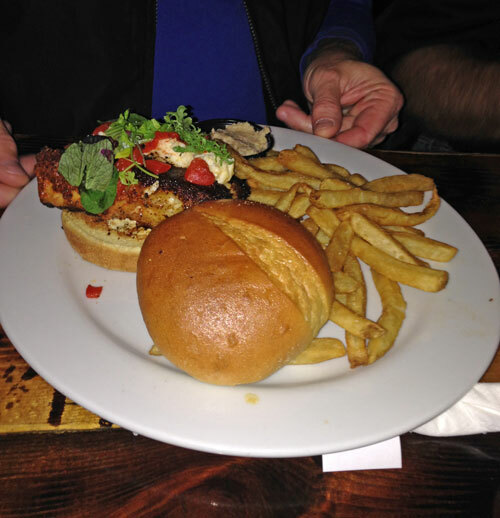 Our group sampled several of the entree’s including three different burgers; the Caprese Burger, the Cowboy Burger and the “We built this City” Burger. 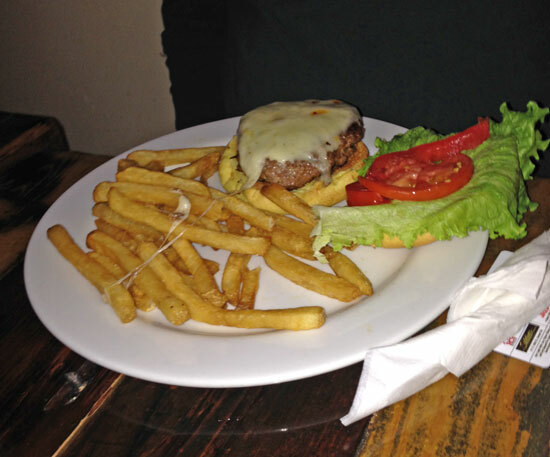 One in our group thought the latter was the best burger they had ever eaten. 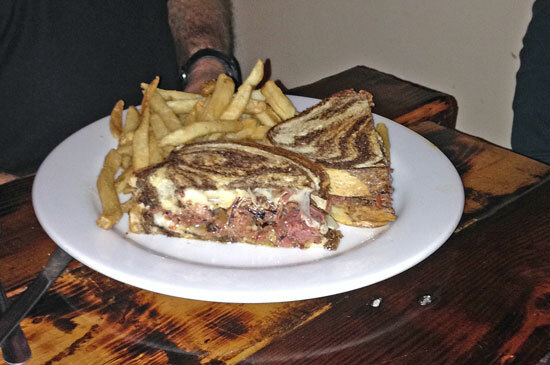 The Blackend Fish Sandwich and the Reuben Corned Beef were also big hits. 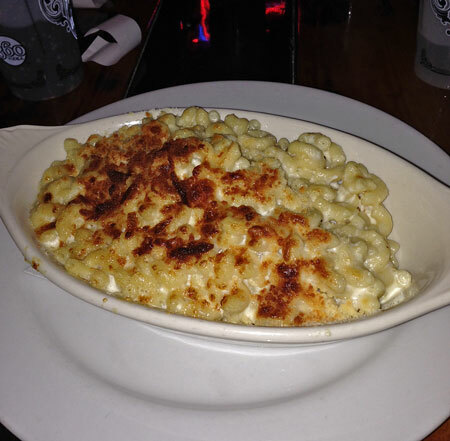 Two of us ordered from the Gourmet Mac and Cheese selection and boy were they gooooood! 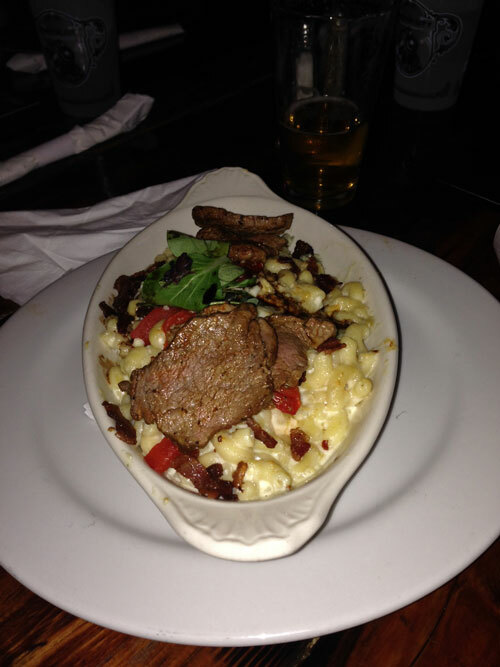 We had Black and Blue Mac (think steak and blue cheese) as well as a Four Cheese version. 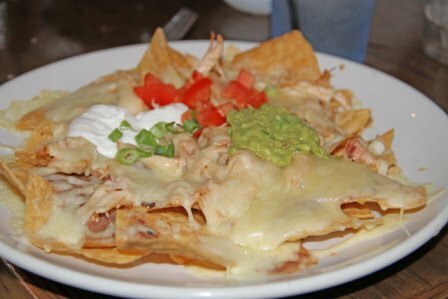 Others ordered a Chicken and Ranch Salad and a unique version of Nachos with homemade flour tortilla chips. 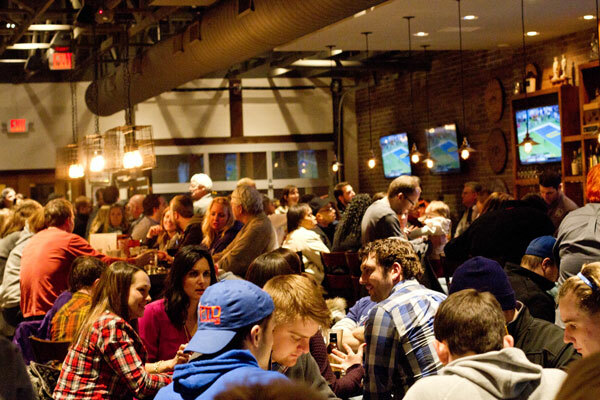 The restaurant was fairly crowded and had a lively bunch of folks watching both the Mizzou and Sporting KC games. Although I have heard the wait can be long for a table, we were able to make reservations and sat right down as soon as we arrived. Several of us commented on the attention and friendliness provided by waiter Dan given how demanding his job was that evening. 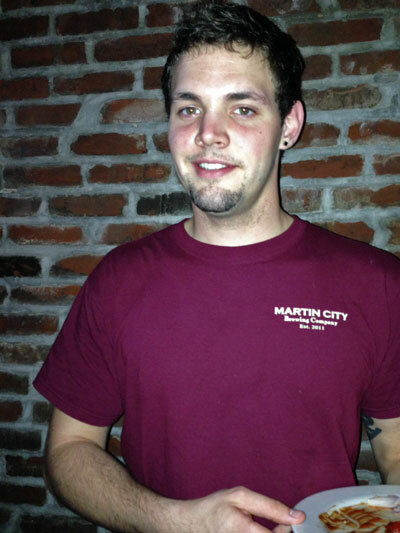 Bottom Line: Another winner for the ABC Dinner Club, we will return to Martin City Brewing Company. 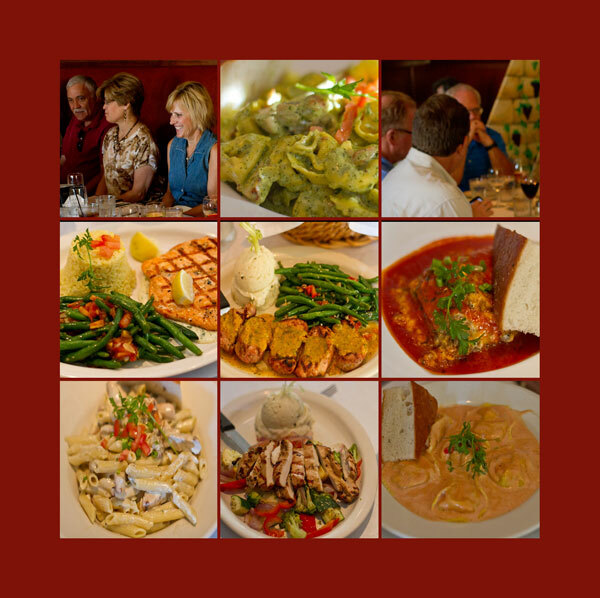 I will start off by saying that most of our group had been to Lidia’s on multiple previous occasions and have had good experiences with great food. That is probably why we were so disappointed in our visit on this occasion. 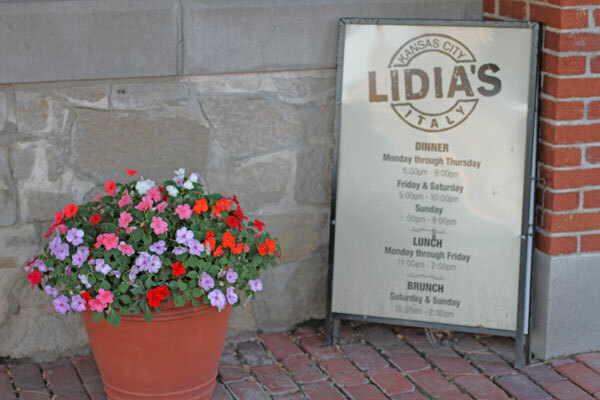 Lidia’s is housed in a beautiful restored building in the freight district of downtown Kansas City. 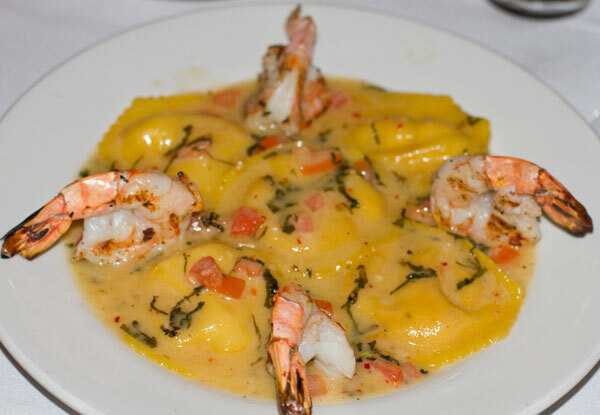 For those who may not know, Lidia’s is owned by Lidia Bastianich, a renowned chef, tv personality and owner of numerous restaurants across the country. We had 7:30 reservations and although most tables appeared to be full, there were not crowds waiting to be seated. Our group ordered the following entrees. 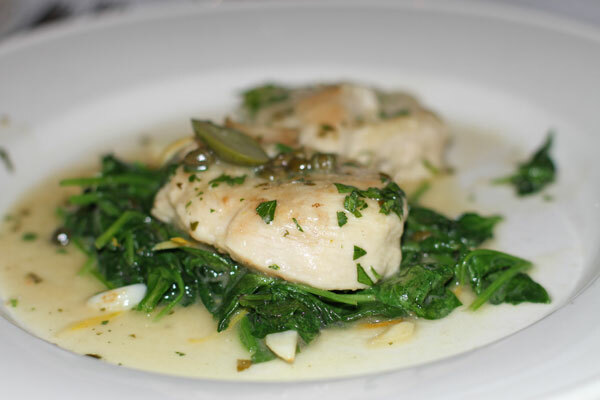 Pollo al Limone – Chicken breast with roasted lemon, capers and olives ($21). 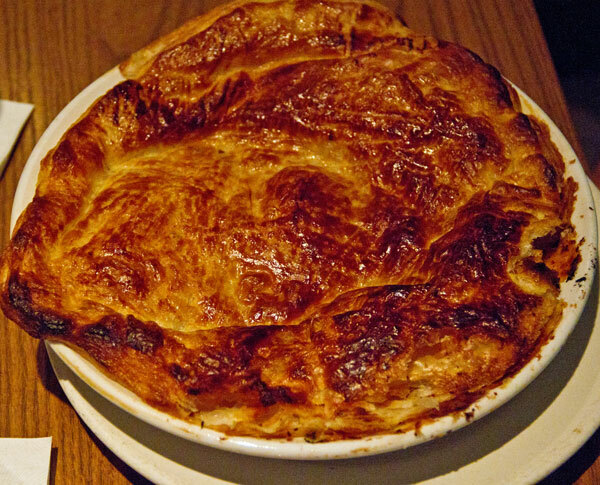 One member of our party also ordered the Lasagna Bolognese ($17.50) but I did not get a good picture of it. We started off by sitting at the table close to 20 minutes before our order was taken. Before our food arrived I had to send my water glass back because it had a bug crawling on it and to add insult to injury (literally), I was whacked in the head by a waiter that was dashing behind me. He did stop to make sure I was ok.
An hour and a half after we sat down our food was delivered to the table. It certainly was not from lack of wait staff as several were milling around the kitchen entrance talking with each other. The food was good, but not excellent. 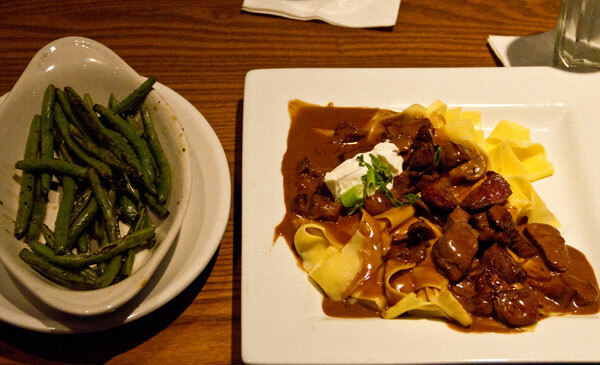 For several of the dishes it was not worth the price of the entree. 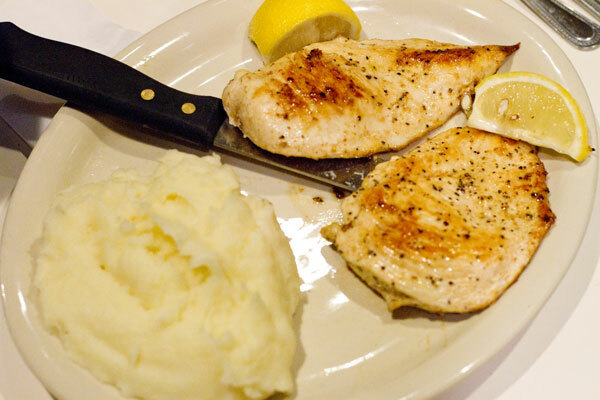 One of our group looked at the small chicken breast that was set in front of her and wondered where the rest of her dinner was, considering the entree price was $21. We asked to speak to the manager considering the time it took to get our meal, the bug on the glass and getting ran over by a waiter. It was more to tell them how disappointed we were in the evening’s meal. It was apparent we were not the only one’s in the restaurant with issues as we overheard/witnessed at least two other tables having problems also. They offered free desserts which we turned down because we had planned to have cake at one of our group’s houses. We asked for the check and the manager came by and said there would not be a check that evening and he comp’d our entire table’s bill. We actually were not expecting that but thanked him for the gesture. Bottom Line: I hope this was just an off-night for the restaurant and not a glimpse of their future. A few in our group said they would probably return but a few of us probably will not. K is for KOBE Japanese Steak and Seafood, 1303 Baltimore Ave, Kansas City, Missouri. 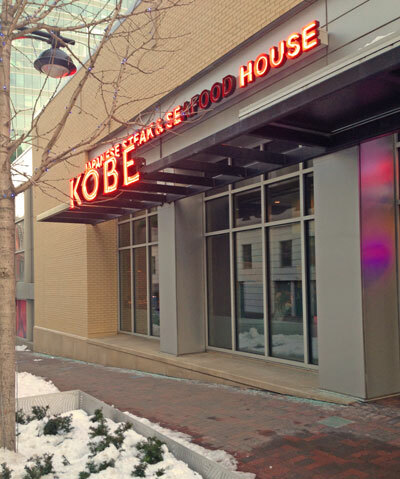 Located in the downtown Kansas City Power and Light district, Kobe Japanese Steak and Seafood is a national chain with 5 locations throughout the U.S. 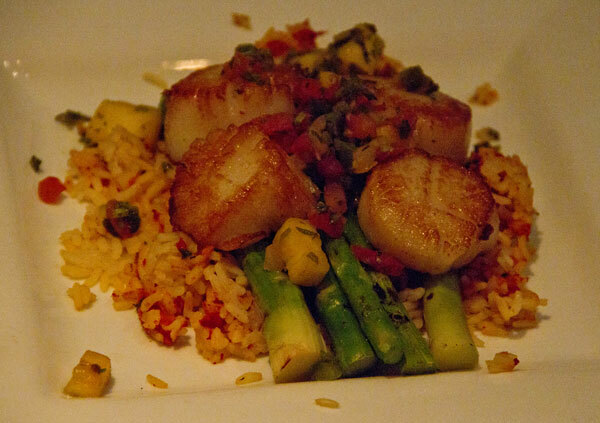 The menu offers approximately 20 different entrees with multiple combinations of steak, chicken, shrimp and scallops. 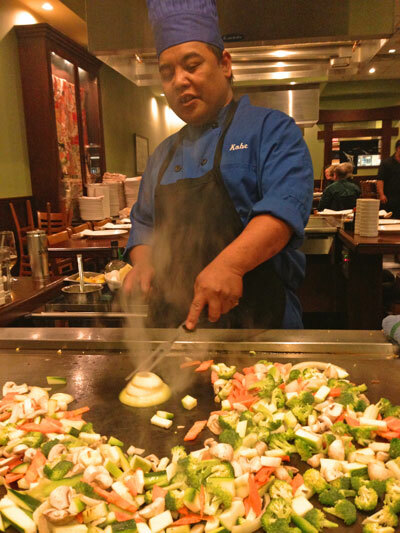 Each entree is served with soup, salad, appetizer shrimp, hibachi vegetables, noodles, steamed or fried rice, hibachi ginger sauce, and white sauce. A full sushi bar is also available. Our group was unanimous in thinking this is a tired recipe for a restaurant venue. We saw the ordinary egg breaking on the edge of the spatula and the familiar flaming volcano with onion slices. We participated in the obligatory catching of the shrimp in our mouths tossed from the grill. Same old, same old. “Been there, done that” was a common description. The food was not bad, although for the price, not worth it. The cost per couple was approximately $75 and that did not include drinks. Add to that parking costs of up to $10 and you have a total thumbs down from the ABC Dinner Club. Bottom Line: We will not return. 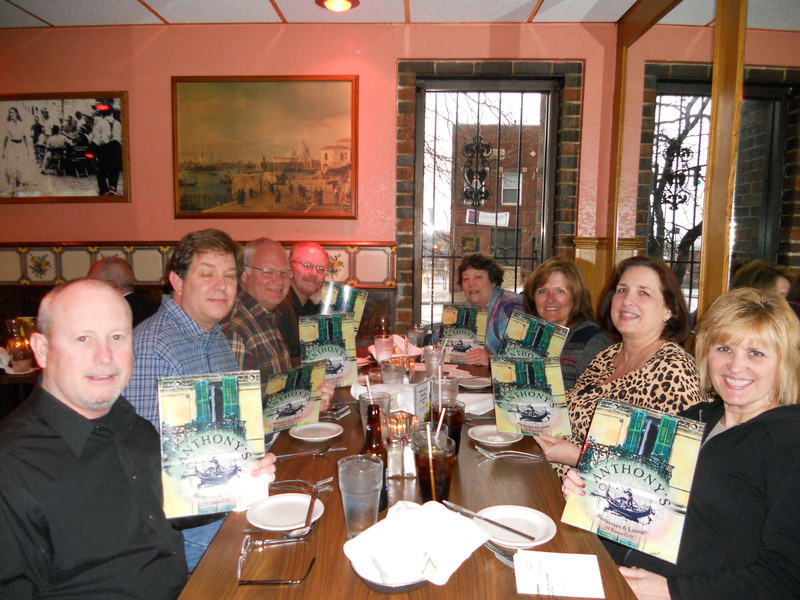 After a long hiatus, the ABC dinner club reconvened at Jasper’s Restaurant, a Kansas City tradition for almost sixty years. Many in our group have eaten there before but it had been several years since any of us visited. Jasper’s Restaurant along with Marco Polo’s Italian Market are located in the Watts Mill Shopping Center at 103rd and State Line. 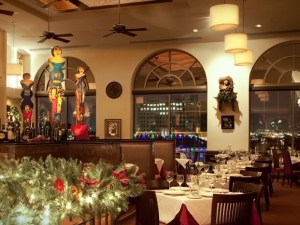 The restaurant is decorated in “contemporary rustic Italian” incorporating many items from the original location on 75th street. We started the meal with wine and warm bread. Our very attentive server soon handed us cold forks for use on our salad which is something I had never experienced at a restaurant before. 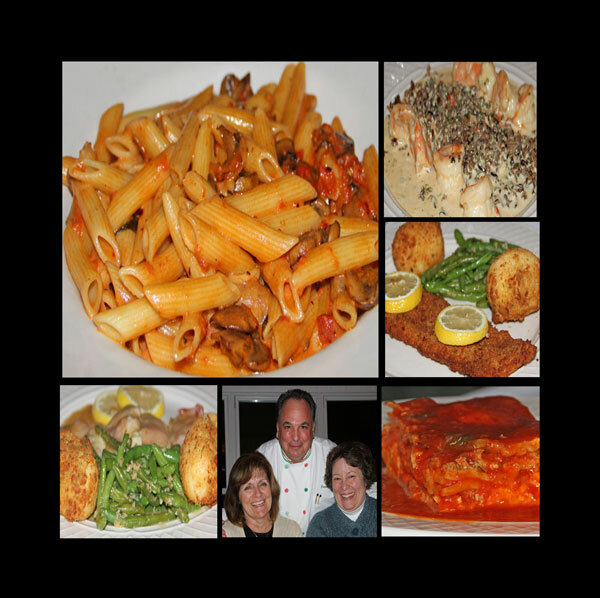 The menu offers a good selection of authentic northern Italian cuisine including the items we ordered listed below. 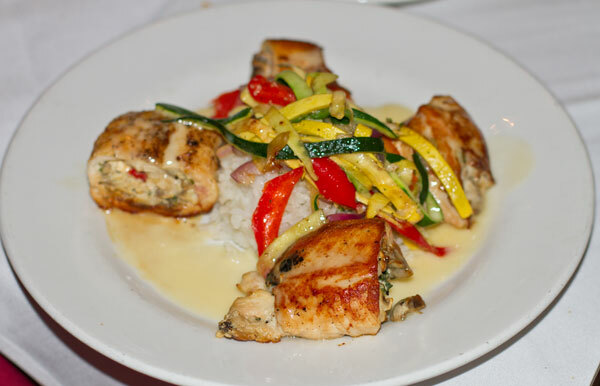 Dinner entrees start at about $15.95. 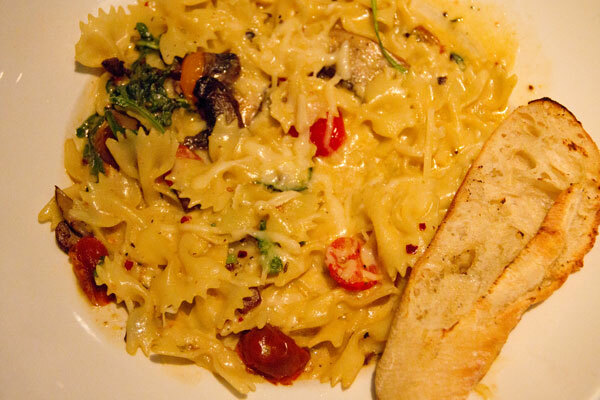 Penne Alla Marie – pasta in a tomato cream sauce with mushrooms and scallops. 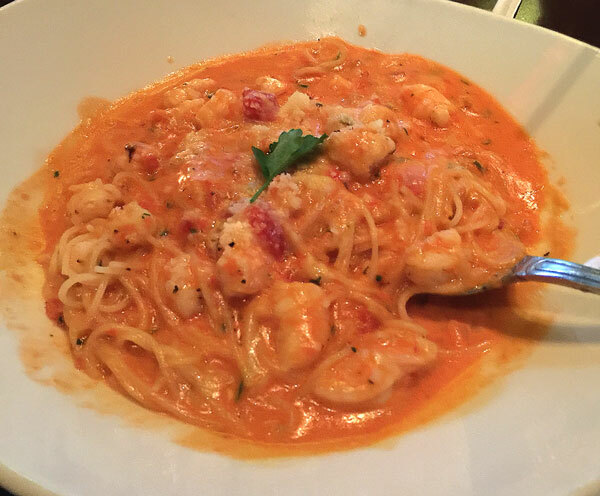 Click here to look at the entire menu. 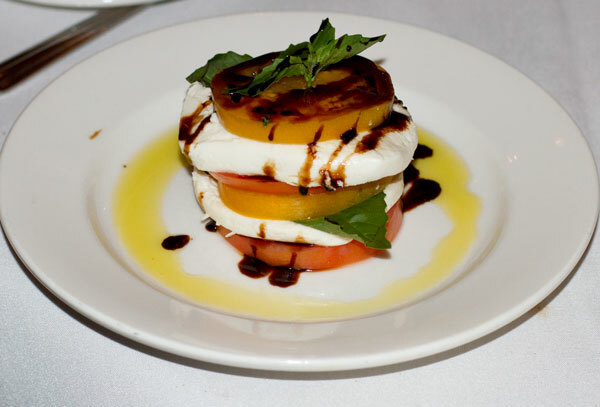 Throughout the evening, Jasper Mirabile walked through the restaurant stopping to talk to diners and for one group prepared a table-side caprese salad. We dined in a window-lined room that overlooked Indian Creek and were able to easily carry on conversation. 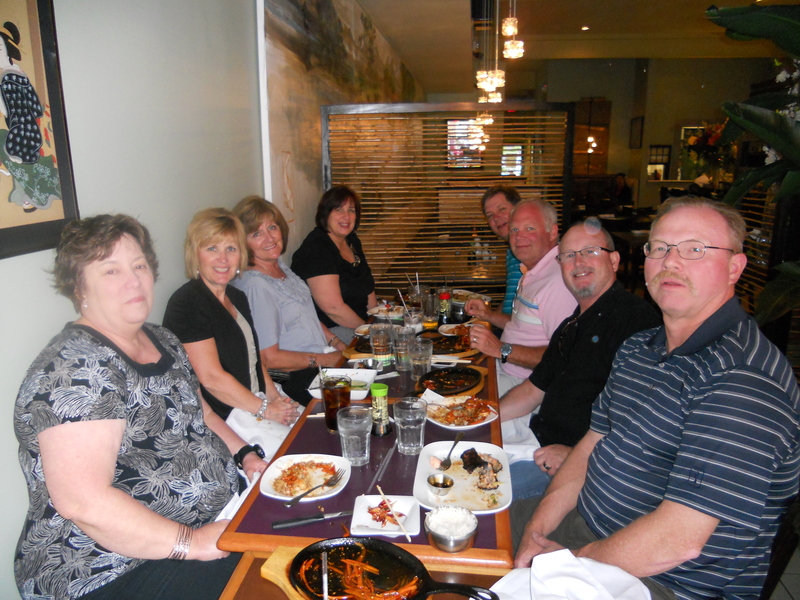 All ten of us thought the food was fantastic! BOTTOM LINE: We will definitely return. 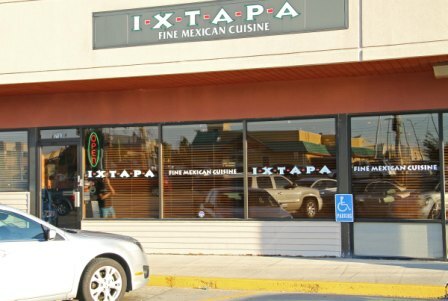 We did not have a large selection of venues in the “I” category but settled on Ixtapa after a recommendation. The word on the street is that this is a sister restaurant to the Guadalajara Café’s in South Kansas City and Lee’s Summit although I was unable to verify this. This very small restaurant sits in a strip mall adjacent to a very busy Quick Trip but we had no issues finding a parking place for our 7:30 reservation. A few of us were in the mood to try their frozen margarita’s but were disappointed that they were out of strawberry. The peach and regular flavors were good, but the raspberry was a little too sweet. The complimentary chips and salsa were typically of any other Mexican restaurant although the salsa was watery and not as thick as most of us prefer. 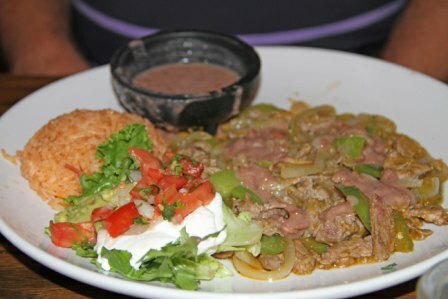 The menu was fairly extensive based on the size of the restaurant and they pride themselves on authentic Mexican cuisine. 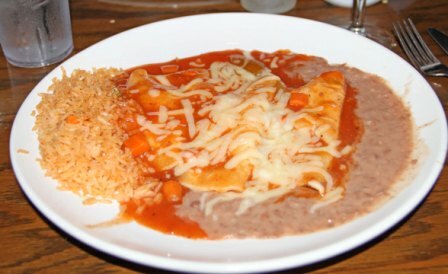 Similar to Guadalajara, they serve several entrees that include cactus and mushrooms, something not found in many Mexican restaurants. 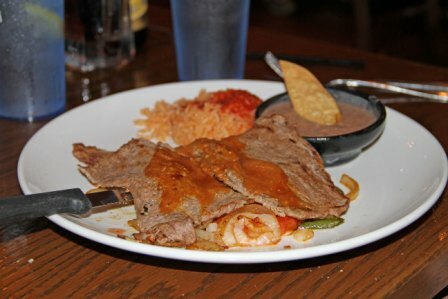 The general consensus of our group was that the food was typical of most Mexican restaurants and nothing extraordinary. Several thought it was rather expensive for Mexican fare. We probably will not return since it was a 40 mile drive from our town and we have Mexican restaurants that are just as good if not better close by. 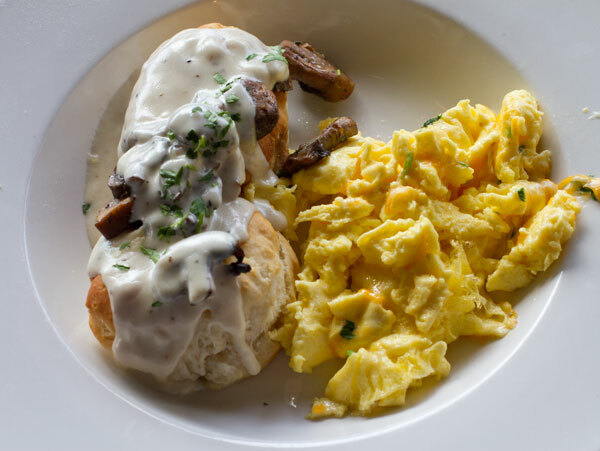 This River Market casual eating establishment is of the Willie Nelson, Toby Keith kind of “country club” versus the exclusive, private and expensive “country club” variety. Our group visited on a Monday night which from my understanding is much more quiet and reserved than the average Thursday, Friday or Saturday night that starts with an energetic happy hour including live entertainment. The weather was perfect for sitting in the outside patio area. Harry’s has a massive selection of both beer and liquor with a good selection of menu items considering this is essentially a bar. 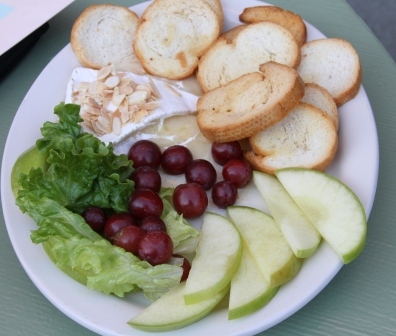 We started with a couple of appetizers, including Baked Brie served alongside fruit and Italian bread plus homemade potato chips and French onion dip. Fish tacos which were pretty good, but not the best ever eaten. 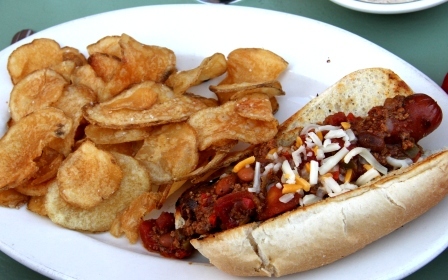 Knife and Fork Chili Dog made with Hebrew National All-Beef Franks. The two diners who selected these thought they were great. 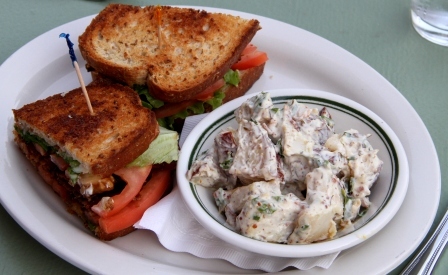 Double smoked bacon BLT served with Baked Potato salad. 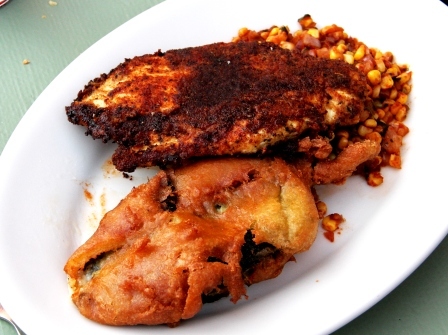 And finally, the Chorizo Encrusted Chicken served with a chili relleno over corn relish which was good but the chili relleno was cold. 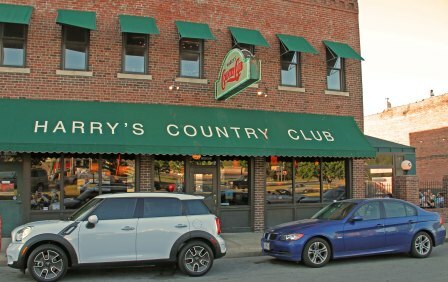 Prior to visiting Harry’s, I had read several on-line reviews that mentioned the service was terrible so I was a little concerned about what to expect. 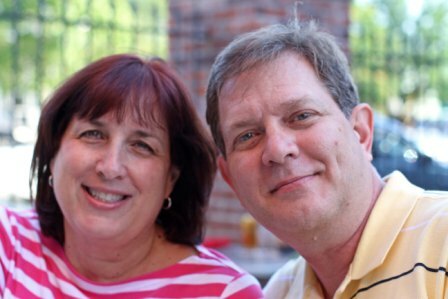 We were in no hurry to eat our meal so the service seemed fine to us as we visited and enjoyed the perfect weather on the patio. 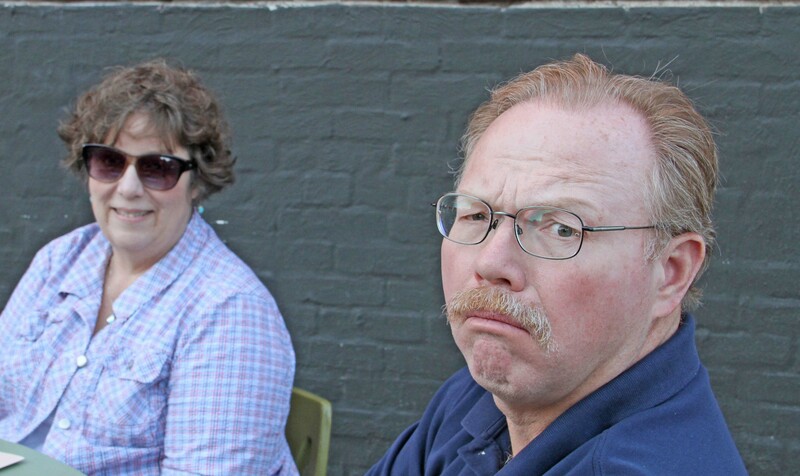 Some of us were a little more agreeable to get our pictures taken than others. One last interesting fact about Harry’s Country Club, there is a unique “artwork” display in the ladies restroom which consisted of two large photo collages of men’s backsides, both clothed and unclothed. As a student of photography I felt compelled to study the pictures, for the image composition and quality of course! Bottom Line: (No pun intended to the preceding paragraph) This is a nice place to go for a casual evening, especially when the weather allows for sitting on the patio. We would return. 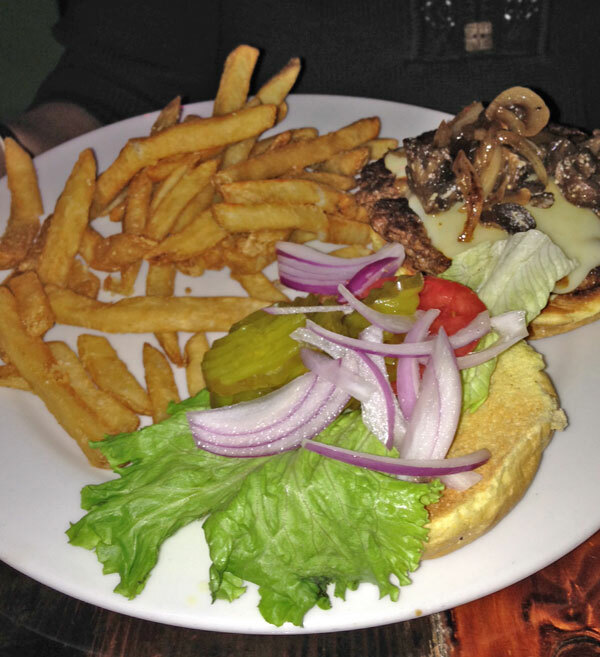 G is for Gaslight Grill, 5020 West 137th Street, Leawood, Ks. It has been a while since the ABC Dinner Club convened, but we finally were able to coordinate our schedules long enough to get to the Gaslight Grill to celebrate birthdays for three members of our group. 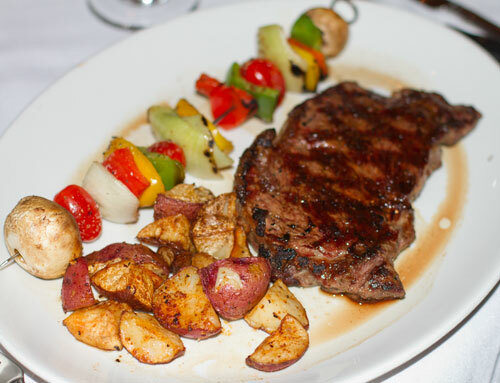 This restaurant specializes in hand cut Angus steaks and fresh seafood. 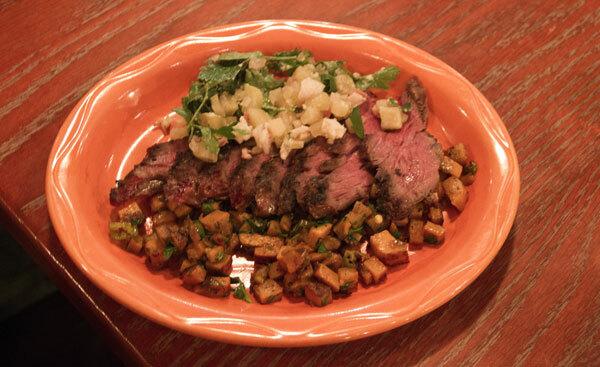 The menu is on the high side with entrees ranging from $20-$38. 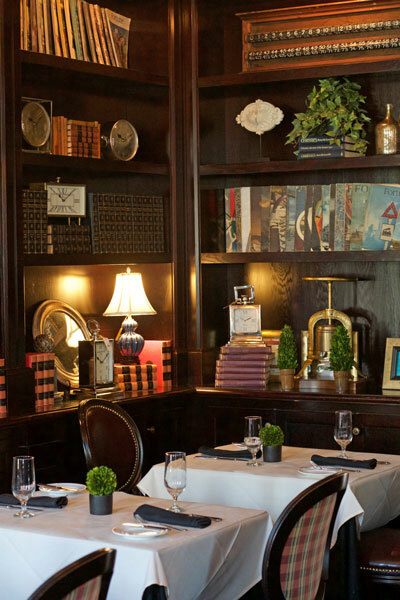 The atmosphere is defined as “casual elegance” and is very comfortable for holding dinnertime conversations. 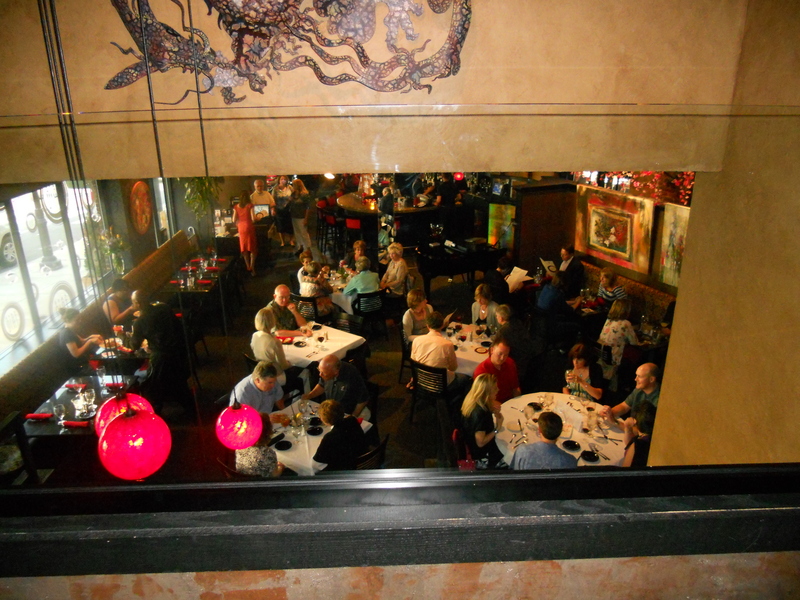 There is an additional back room with tables where live jazz music is played. I apologize in advance for the following pictures, my camera was having technical difficulties and Dave stepped in with his IPhone. 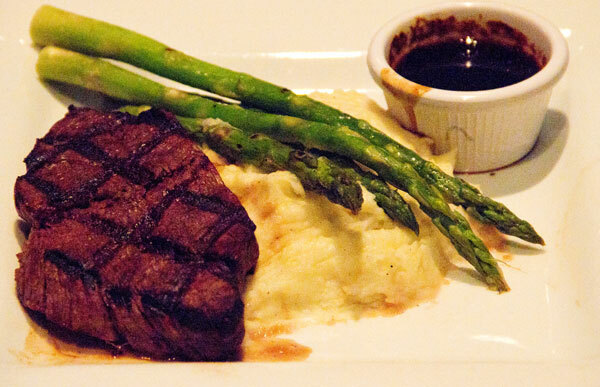 6 oz petit tenderloin filet with sour cream and chive mashed potatoes and asparagus – the filet was very tender and cooked exactly as requested. Tuscan Rosemary Chicken served with herb roasted potatoes and a carrot, zucchini and corn mix – good but the diner was expecting a breast not a chicken quarter. Small Plate Trio which consisted of a small piece of beef, one scallop and one jumbo shrimp – the beef was almost rare when medium was ordered. It was a very small amount of food for a large price, $23. 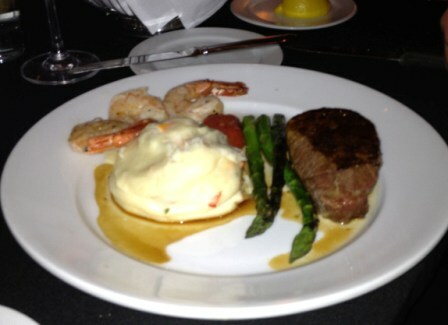 Filet & Prawn, which consisted of a 6 oz tenderloin steak with 3 giant prawns. Served alongside were lobster mashed potatoes and asparagus – two members of our group ordered this and thought it was great. 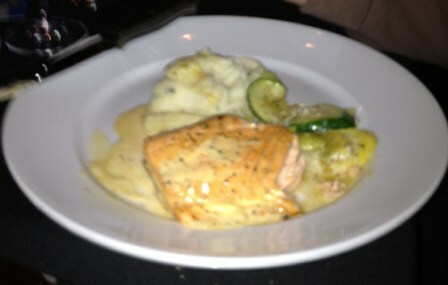 Atlantic Salmon filet with mashed potatoes and grilled zucchini with squash – again the diner thought this was very good. We also tasted the pumpkin cheesecake and apple tart. I think everyone in the group thought the food was very good but a little pricey for our normal dining experience. Most of us agreed that this restaurant falls into the special occasion category and is probably not a place we would frequent very often. The “F” selection for our ABC Dinner Club outing was chosen by the birthday boy in our group whose co-workers had recommended the restaurant. 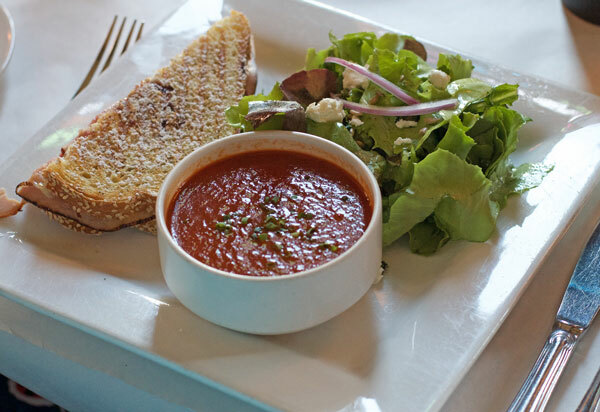 Located on the corner of Third and Delaware in the River Market area, this two year old “Farm to Table” restaurant promotes healthy and locally produced goods, even listing the farm and bakery vendors on the back of the menu. The dining room with it’s high ceilings, stringed lights and polished wood floors was comfortable, relaxing and conducive to good conversation. Our dinner started with a delicious sampler of local cheeses from Green Dirt and Heartland Farms served alongside homemade crackers. Former wine bottles filled with water were placed on the table for immediate self service. 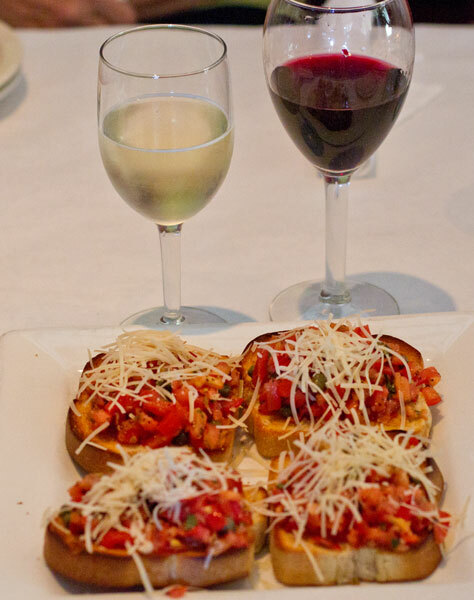 Each menu selection included a recommended pairing of wine and beer. 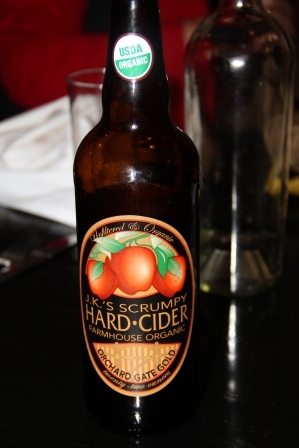 I had a taste of this unfamiliar brand of organic Hard Cider and might have just found my new drink of choice. There were raves about the chicken and steak. 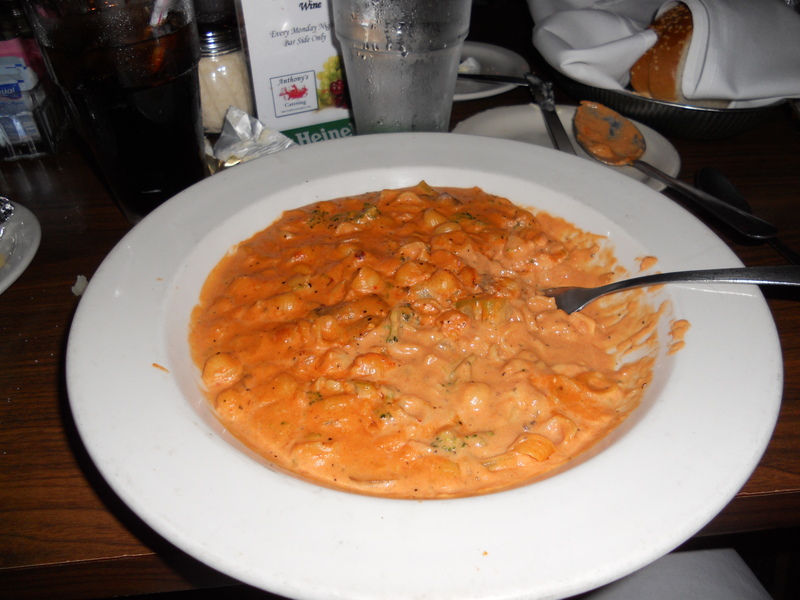 The ravioli was also very good but a side vegetable entrée would have been nice since the portion consisted of only three ravioli. 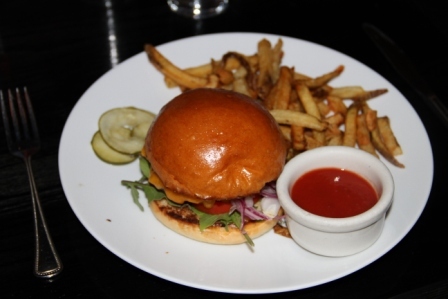 The burger was good, but the homemade ketchup was not a hit with one particular diner. 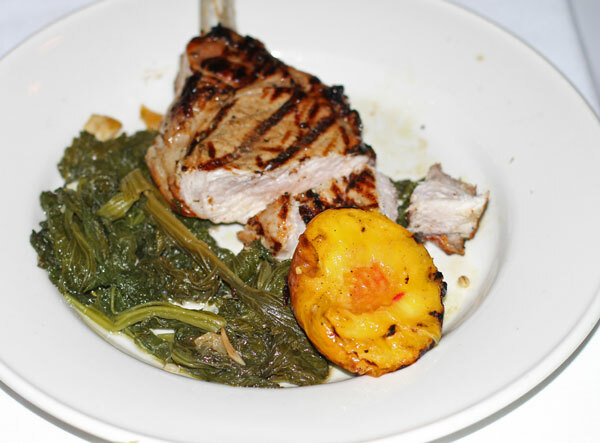 The pork entrée was tough and overpriced according to another diner. As would be expected in a restaurant advocating healthy choices, a few of the entrees were on the smaller side, even though the prices tended to the higher side. 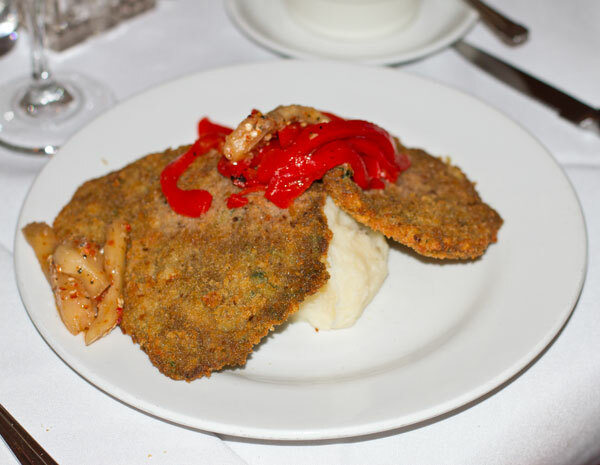 The presentation of the food was gourmet quality and somewhat surprising for a self proclaimed “homestyle” restaurant. In my unsophisticated culinary world, homestyle and gourmet are mutually exclusive. I am glad Farmhouse was able to educate me on this topic. Bottom Line: All but one in our group of eight would definitely return to this restaurant, maybe for the brunch or lunch menu. 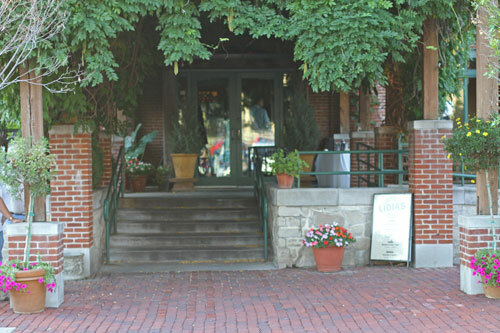 A sping/summer visit would also be nice to sit on the outside patio and see how the menu changed with the season. 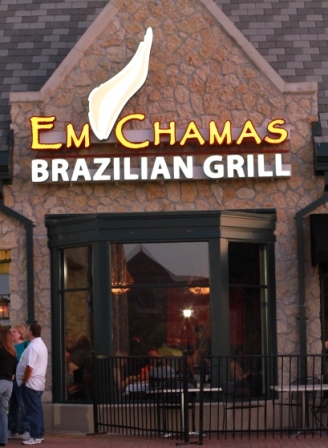 Em Chamas, located in the Tulleries Plaza at 6101 NE 63rd Street, is modeled after the Brazilian Steakhouse Concept. 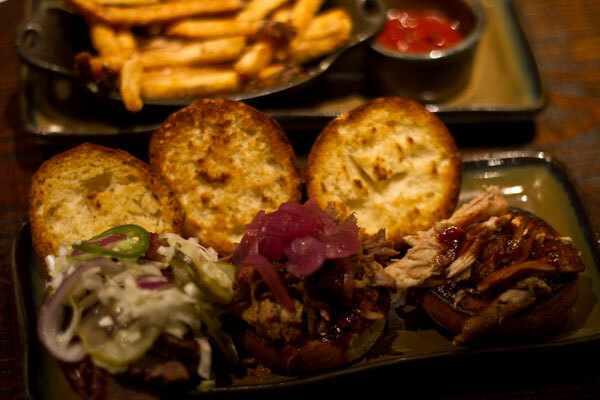 Each meal is one price, $36, which gives you unlimited trips to the food bar for your first course. I typically am not a fan of buffet style eating in a restaurant. 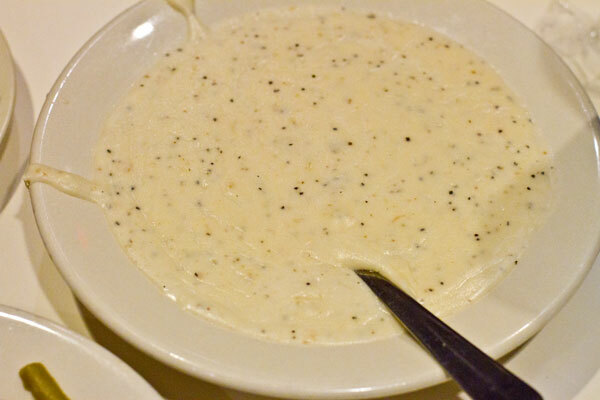 Not only does it offer the opportunity to eat way more than you should, but there is something about dipping into the same bowl as a million other strangers that mildly disturbs me. However, this food bar was well-tended and did offer a large assortment of choices. The salad selections included mixed greens and romaine lettuce, marinated asparagus, coleslaw, chick pea salad, pasta with peas salad, marinated mushrooms and olives just to name a few. There was a bread selection as well as oysters on the half shell. Hot choices included mashed potatoes, pasta with marinara, rice and black beans. 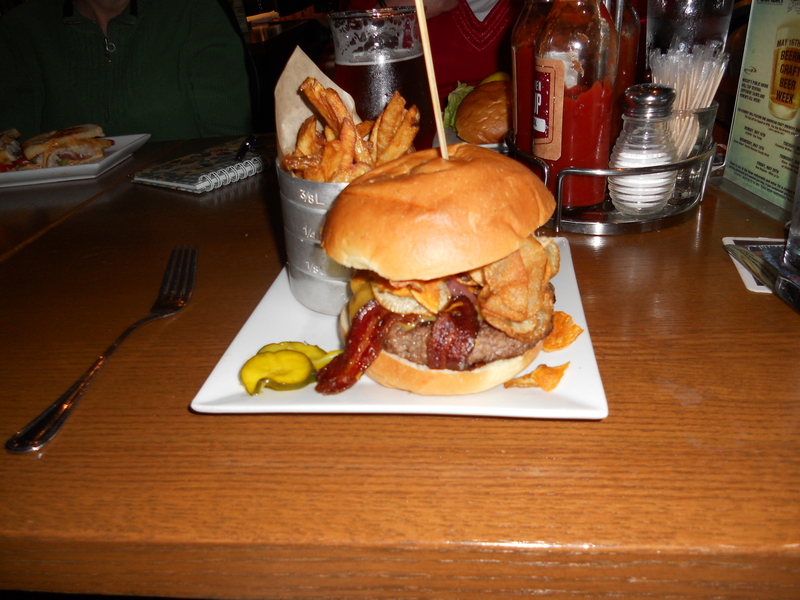 For those like my husband, who believe a good meal is a slab of meat, this was heaven. The servers were constantly at the table slicing and serving as many portions as desired. It was a fast paced atmosphere and if you are looking for a quiet relaxing dinner then this is probably not a good choice. However, no one, including this infrequent meat eater, could walk away from this restaurant hungry. Bottom line: All agreed we would return to this restaurant. 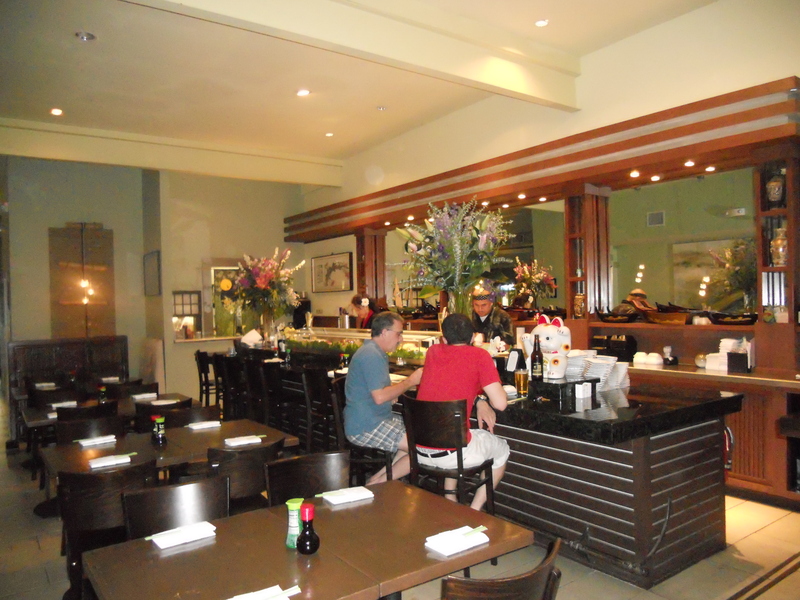 Domo Sushi & Grill is located at 6322 Brookside Plaza. This was a real step outside of the comfort zone for several in our group. 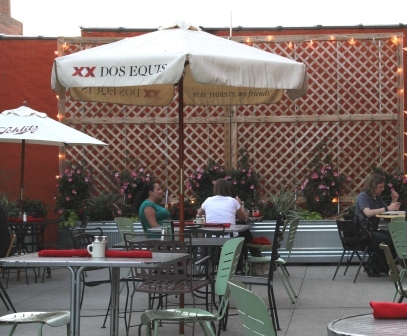 as well as tables and booths or patio dining for those wishing to enjoy the nice weather. Street side parking is available. 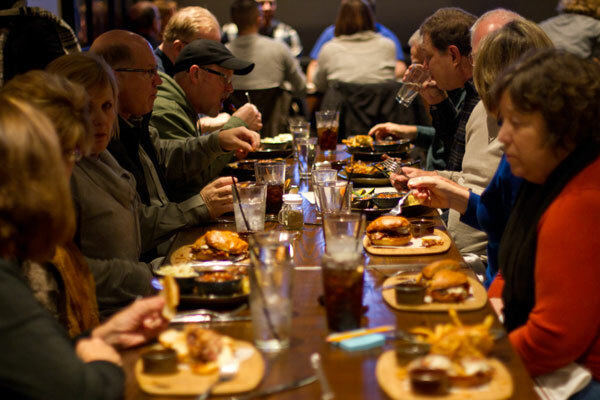 We were able to call ahead for reservations, which is helpful when dining with eight members in the party although it was not necessary on this particular Saturday night. 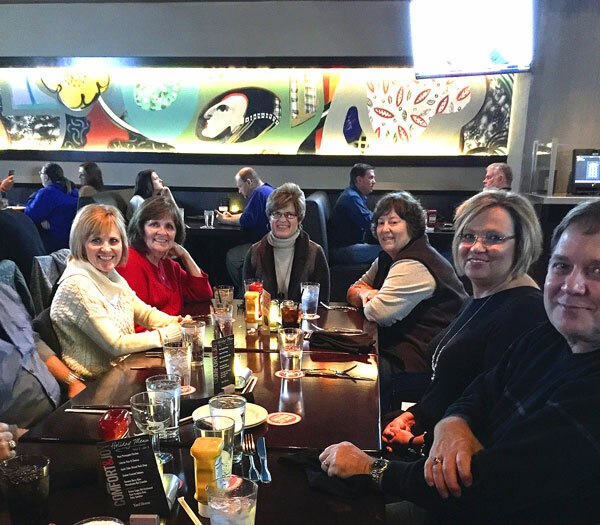 Our server, Kathy, was extremely accommodating as she helped us navigate the menu and understand the items. 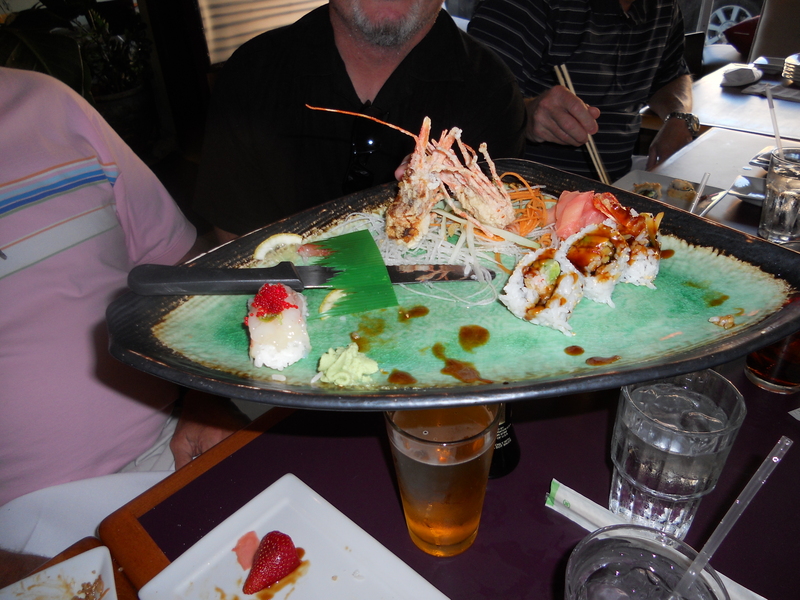 The meal began with some sushi appetizers such as edamame, eel, sweet shrimp, California roll and a vegetable sampler. The edamame was enjoyed by several in the party. The California roll was very tasty as were the eel and sweet shrimp. The vegetable sampler was less appealing to those ordering. Sapporo beer was also enjoyed by some at the table. The entrees were excellent and those we sampled included shrimp or chicken teriyaki, house salmon, shrimp salad and tonkatsu (pork cutlet). Entrees ranged in price from $15-$25. The presentation of appetizers and meals was beautifully done. The meal ended with a few ordering saki. 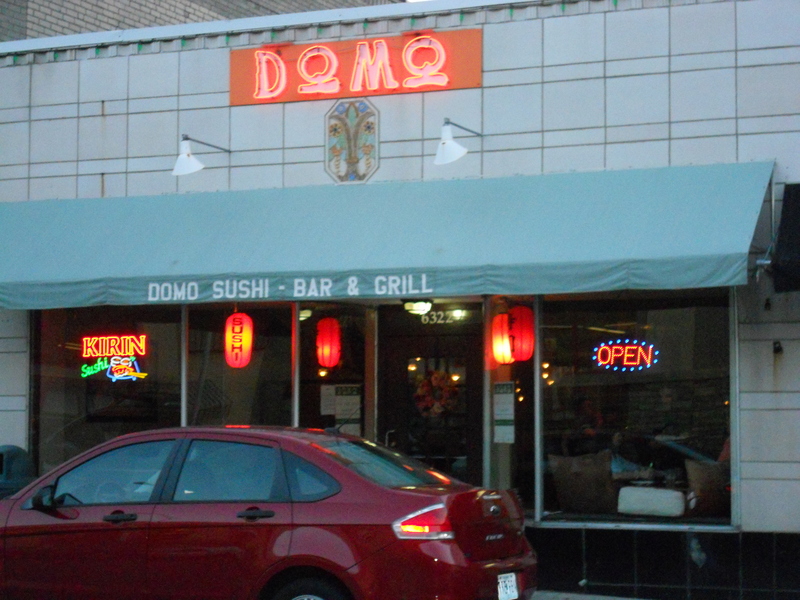 Bottom line: 7 out of the 8 dining would go back to Domo again. 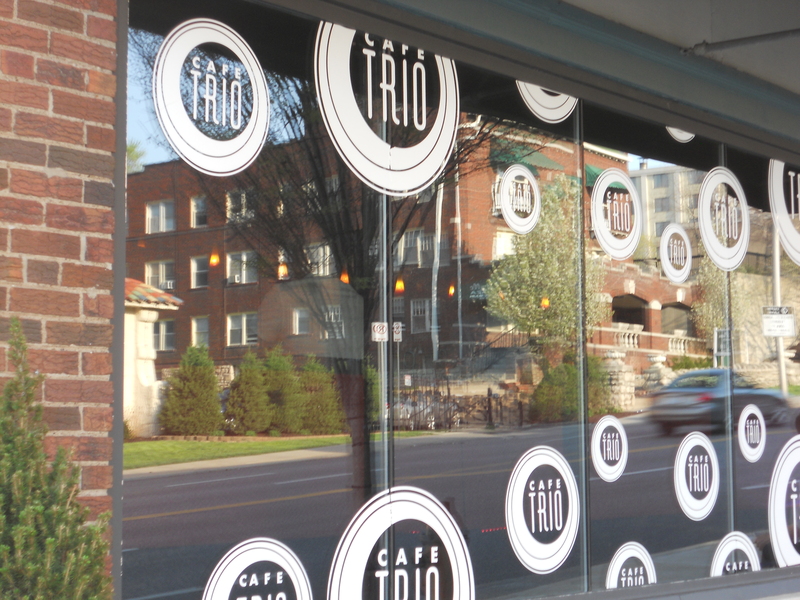 C is for Cafe Trio, a stylish and upscale restaurant on Main, just north of the plaza. I know we are out-of-order here, B usually comes before C, but Joy chose this restaurant for her birthday dinner and we could not pass up commenting on this great place. 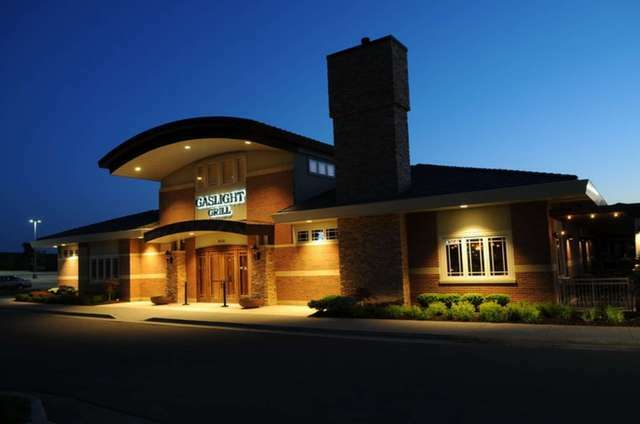 Valet parking is available at a cost of $5 but can be credited against your meal ticket, otherwise there is ample parking behind the building. Reservations were extremely easy to make on-line…I entered the date, the number in our party and the approximate time we wanted to eat. The available times were presented back and I was able to choose which I preferred. When we entered the restaurant they lead us to our table in an upstairs room. The staff apologized at least 5 times that I had to walk up the steps with my cane. They said to tell them the next time we come and we could have a table on the first floor. 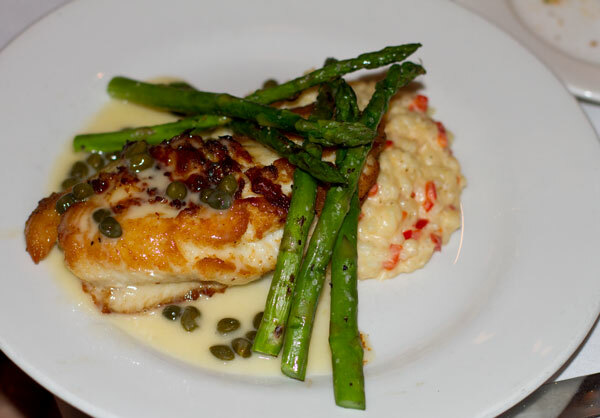 Our entrees consisted of Pistachio Encrusted Tilapia, Seafood Lasagna, Filet Mignon, Mac Daddy(a grown-up version of mac-n-cheese) and Swordfish which was one of the specials for the night. 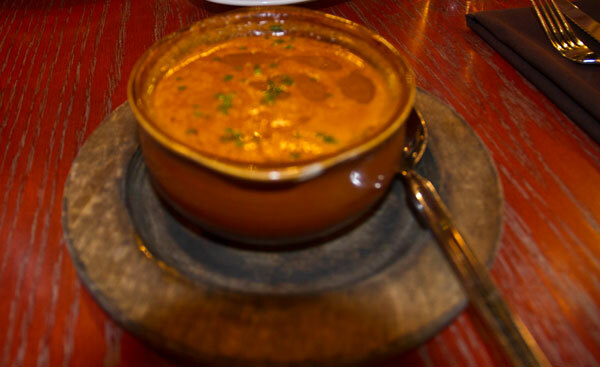 The average cost of the entrees was $26, a little pricier than our usual fare, however they did offer a very interesting assortment of “Small Plates” along with pizza, soups and salads. 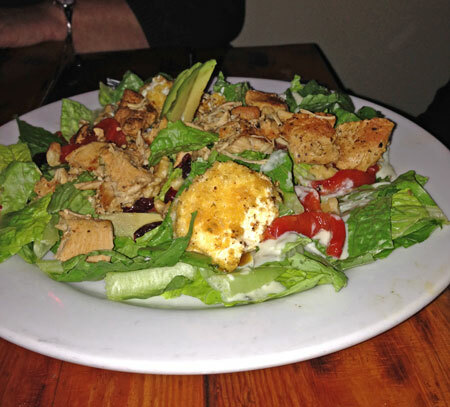 Bottom Line: The wait staff was very attentive and the food was outstanding. Can’t wait to return! 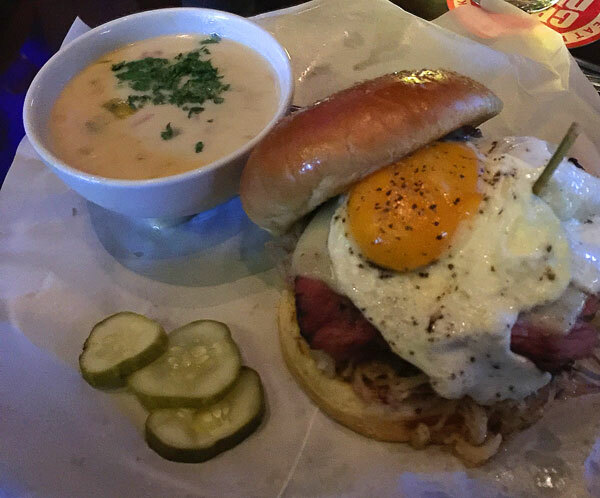 When I first heard the name of this restaurant, I thought I would not enjoy eating at a bar, but it is much more than a bar. 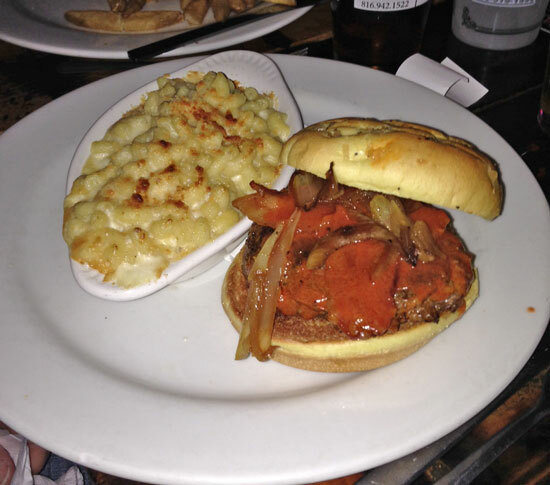 The Beer Kitchen is located in the heart of Westport, at 435 Westport Road to be exact. 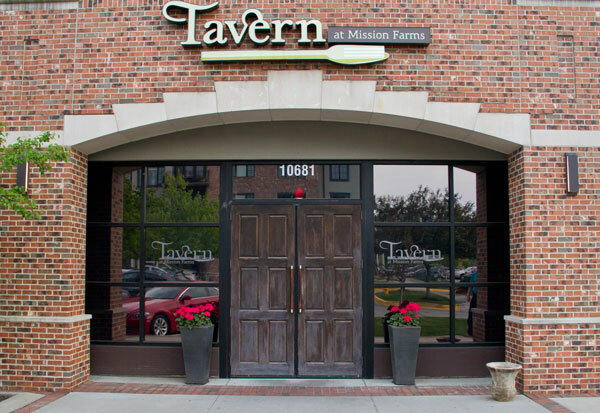 Reservations were easily made by phone and it was a good thing because the night we chose to eat there was also the day of the KC Pub Crawl for Cancer. There is a small parking lot across the street, on street parking and a big parking lot a block west. Upon entering, one notices a young and hip ambience. 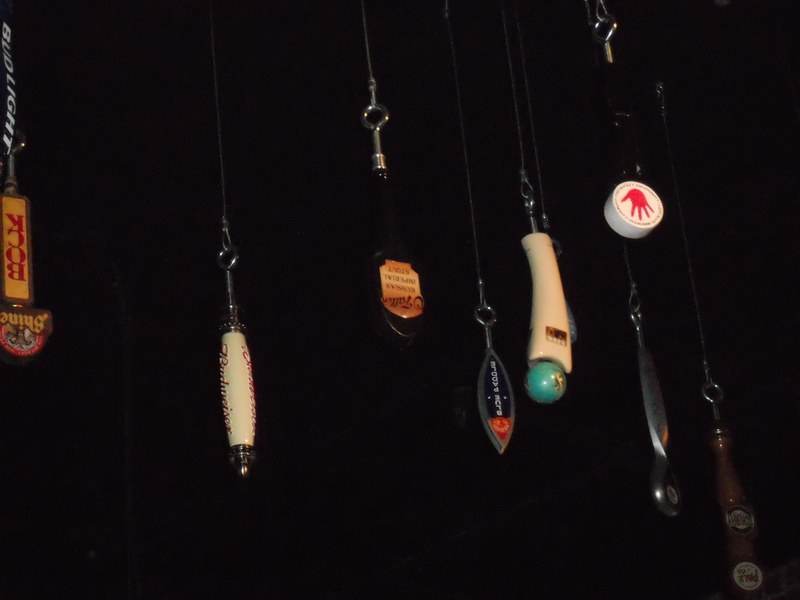 Tap handles hang from the high ceilings. There are many choices for seating; booths, tables and chairs, communal seating at long tables, high top tables and of course, at the bar. There are too many beer choices to mention, hence the name beer kitchen. Two in our party sampled the pear cider and recommended it highly. 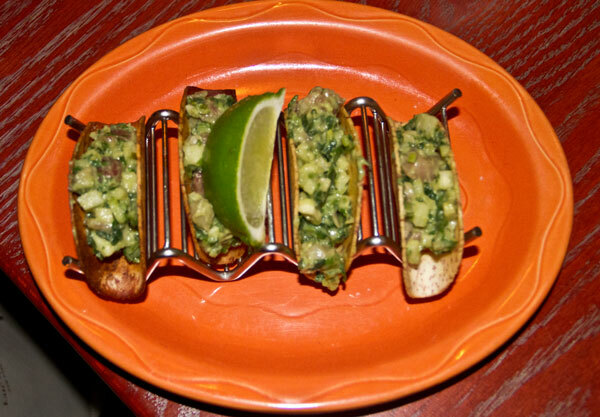 We began our meal with the Cheese Ancho Corn Dip served with blue corn chips and salsa verde. The dip was superb. 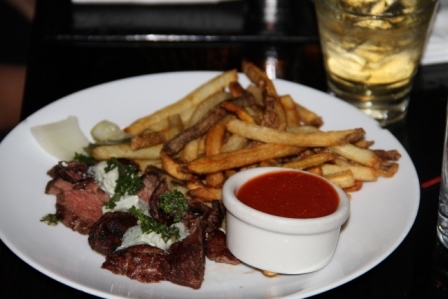 The entrees ranged in price from $7.50 for the BK Classic burger to the $18.00 Flat Iron Rib Eye. 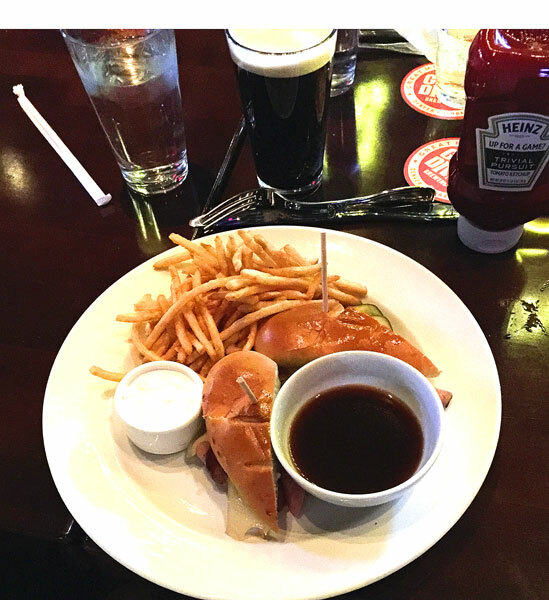 Most in our party ate some form of a burger such as the Brick House, BK Classic, American Colby or Brat Burger with the exceptions being a Turkey Turkey (2nd turkey referring to bacon) sandwich, Big Fish sandwich and 3 Cheese on Sourdough. 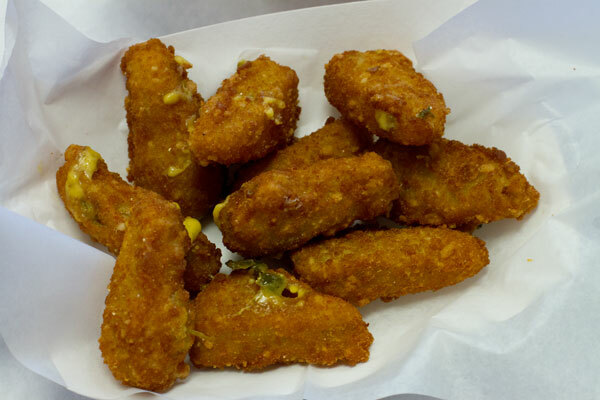 There are many options for someone wanting vegetarian or vegan choices. 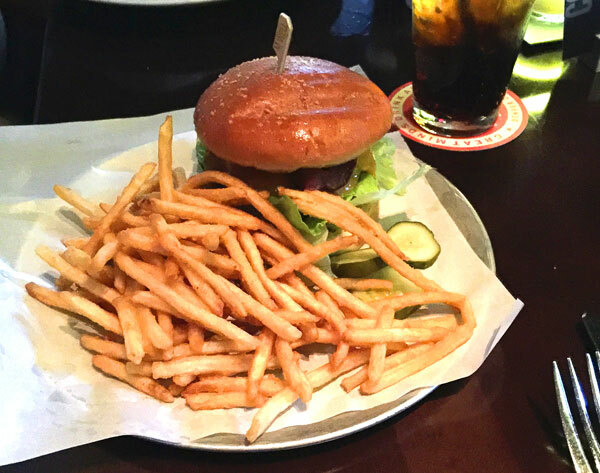 Fries were the side order for the majority in our party. 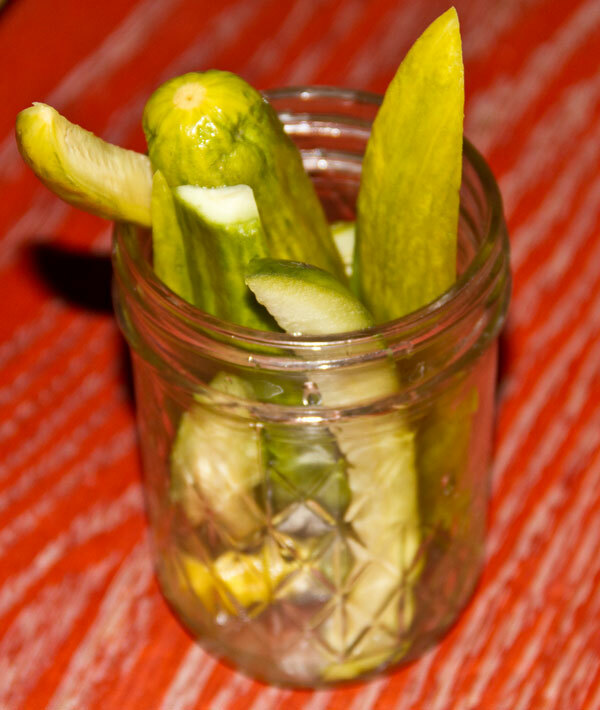 They were artfully presented in a metal measuring cup. 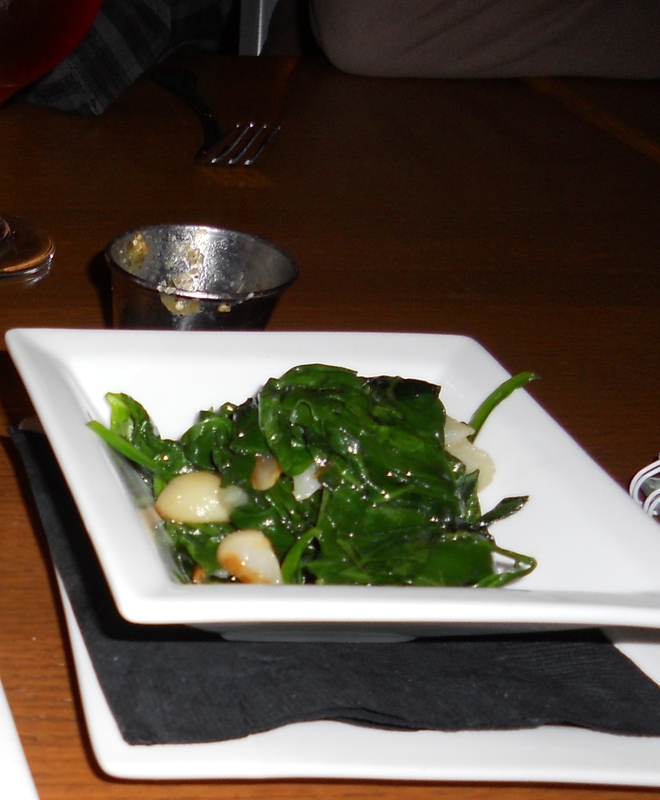 Another side that was ordered was the Roasted Garlic Sautéed Spinach. 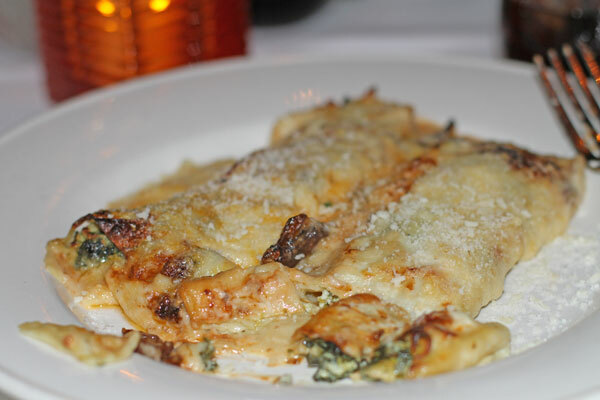 For spinach lovers, it never tasted so good! Another side sampled was the Cole slaw, again another hit. The restaurant staff was pleasant and attentive even though extremely busy on this evening. Bottom Line: The Beer Kitchen proved to be a big hit. We all agreed that we would try it again. 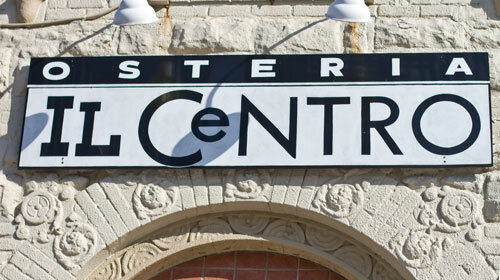 Our only advice would be to make the trip to Westport on a day other than the KC Pub Crawl! 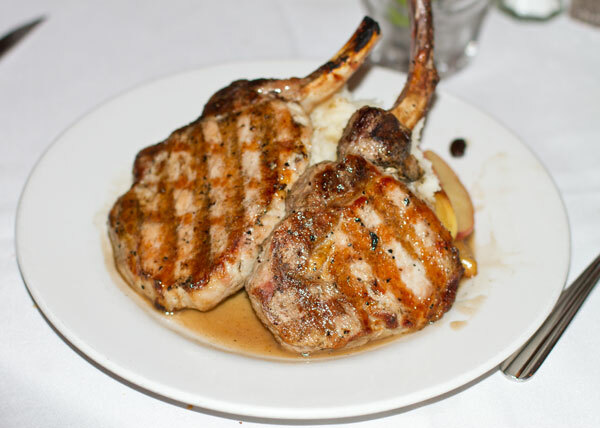 A is for Anthony’s Restaurant and Lounge, a fixture at 701 Grand in downtown Kansas City for 31 years. Thanks to a Muncharoo.com coupon we all had at least $10 off our individual checks for the evening which always starts dinner on a high note. 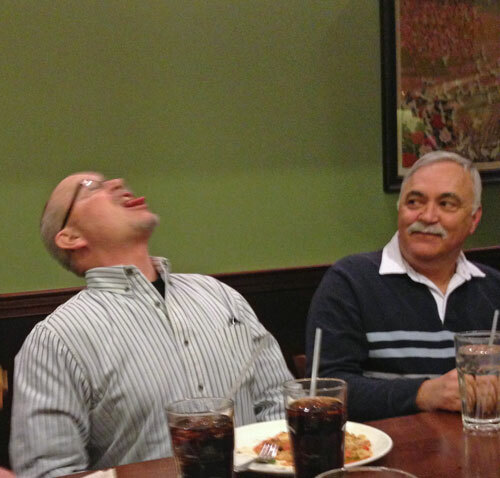 David had not been drinking…..I promise!! 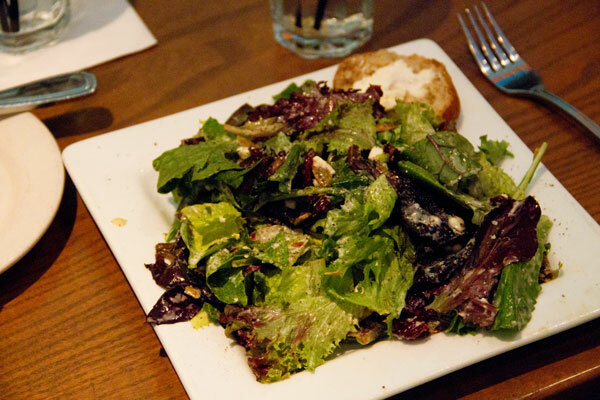 We all started with salads and ate several baskets of the Italian bread that was brought to the table. 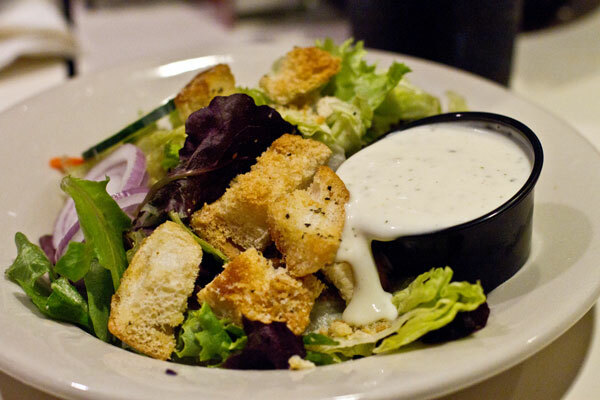 House Salad with blue cheese dressing. Cavatelli con Broccoli, Chicken Lemonada, and Chicken Fettiuccini. 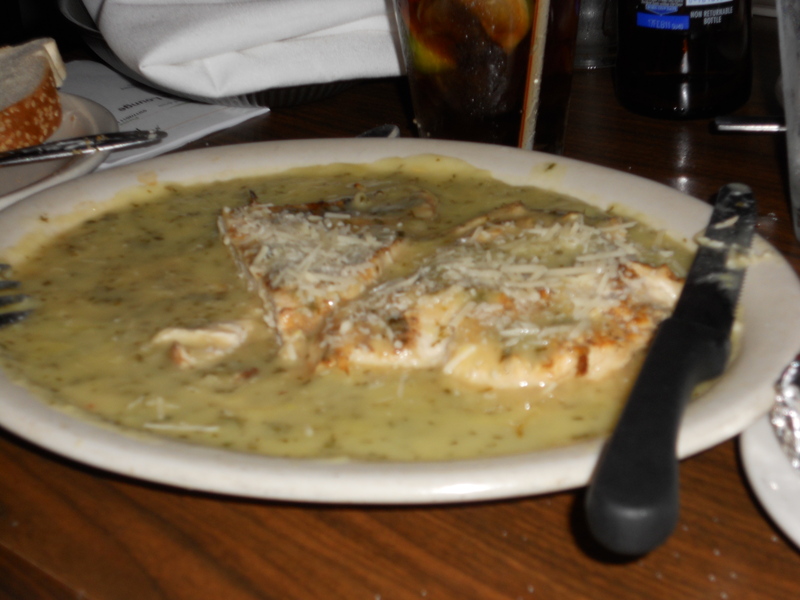 The portions were large and the sauces were heavy, not a place if you are trying to watch your calories. Bottom line….we will definitely come back here.